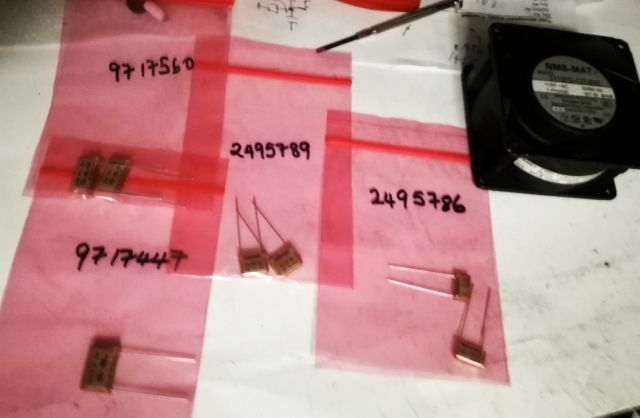 After some weeks, the spare parts arrived – RIFA X2/Y2 rated capacitors (now made by Kemet), a full set (see earlier post, 6038a repair). And a fan, from China. The fan, upon close inspection, it has a broken frame, but fair enough, I will use this one while a replacement is on the way. 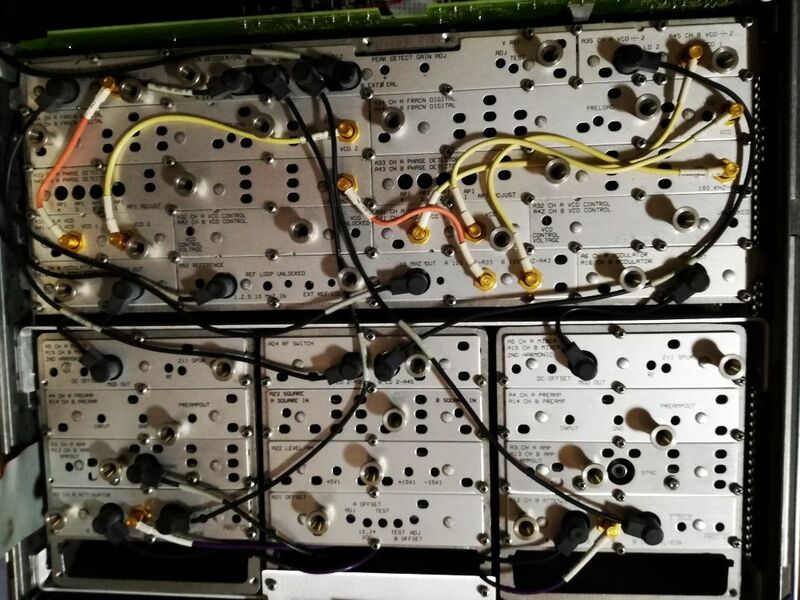 A lot of dust removed from the case and boards, all completely disassembled. 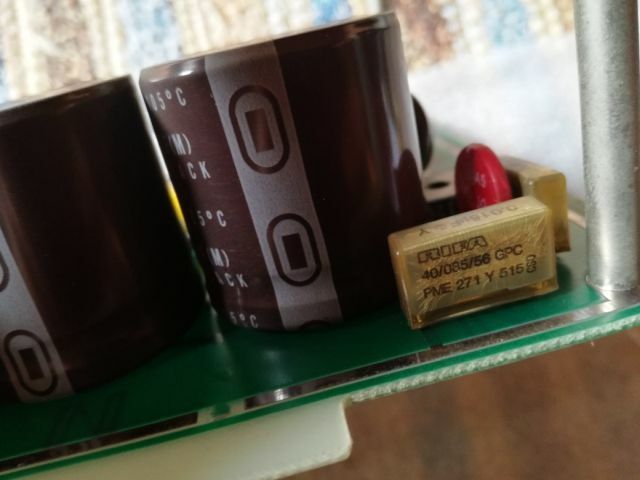 The X and Y capacitors all replaced – the old capacitors are still working, but cracked and it is good practice to replace them, unless, you want to risk a lot of smoke and stench (usually, at least no fire risk). 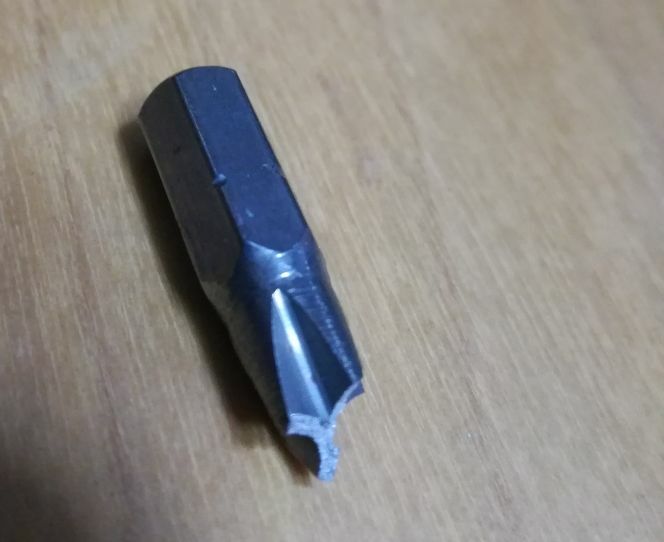 Always good to use high quality tools – I only have low quality tools here, and bits that crack! 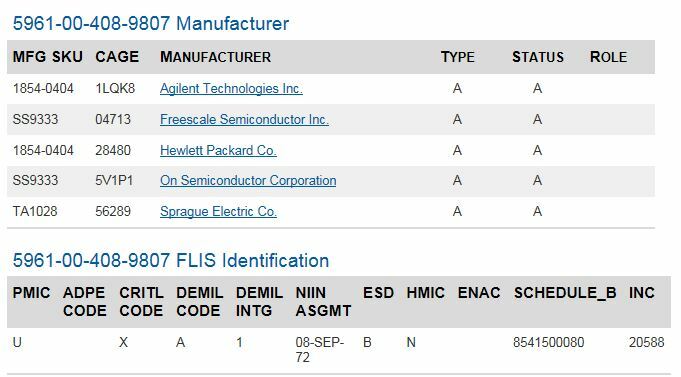 …finally, some testing. It is working, the fan is providing a substantial amount of cooling, it is definitely big enough for the unit. 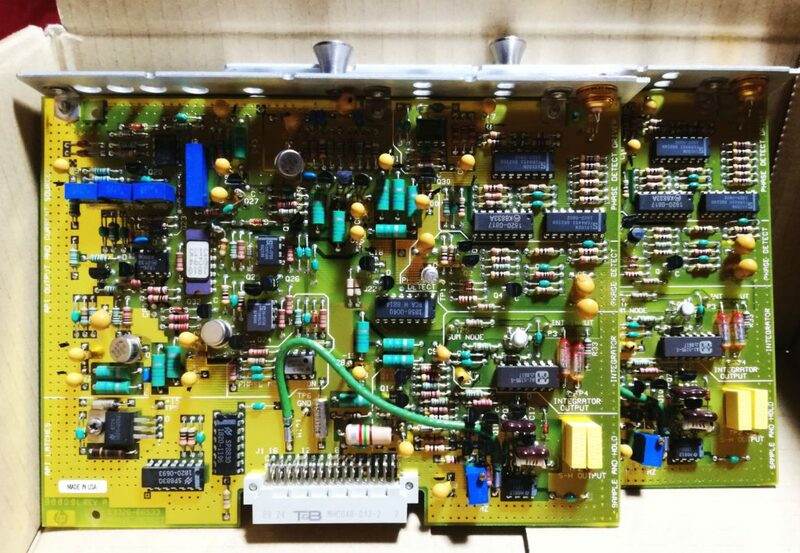 With the repair of many spectrum analyzers, it turns out, the preselectors are usually not easily damaged, because of their self limiting characteristics, and because of the absence of active parts. 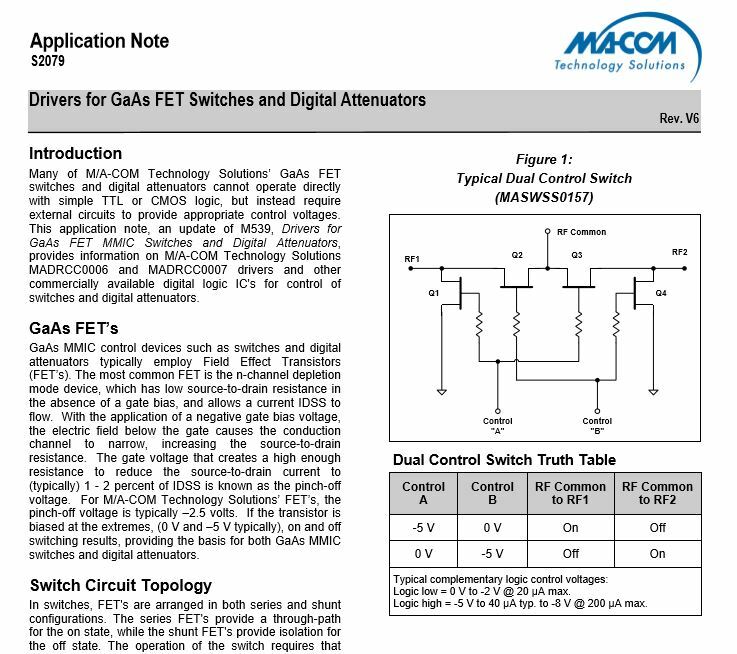 The SYTF is diffient in that it has an active part, a switch. 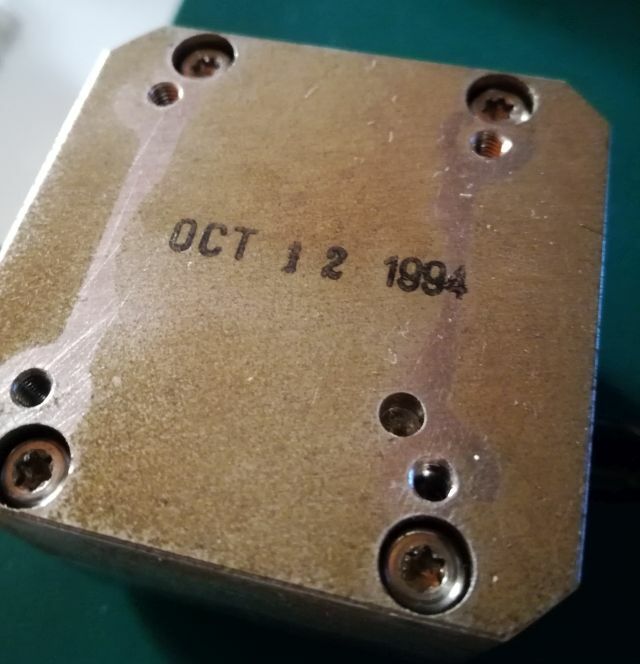 It is already some years old, but no reason why such parts should have much aging at all. 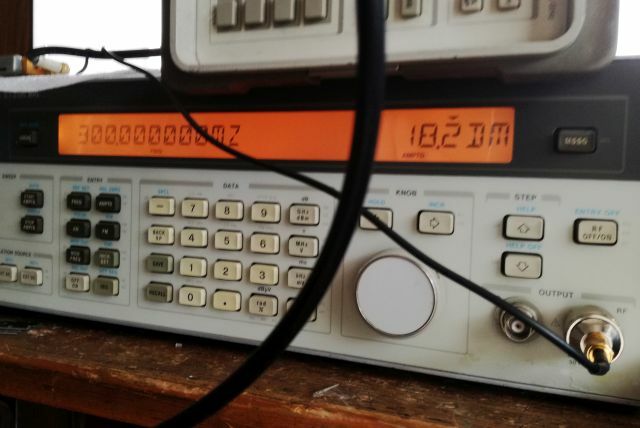 The symptom of this unit, it is working in the low frequency region setting, LOW band out, but the high band is dead, loss in excess of 35 dB, at all frequencies, and independent of the tuning current supplied. 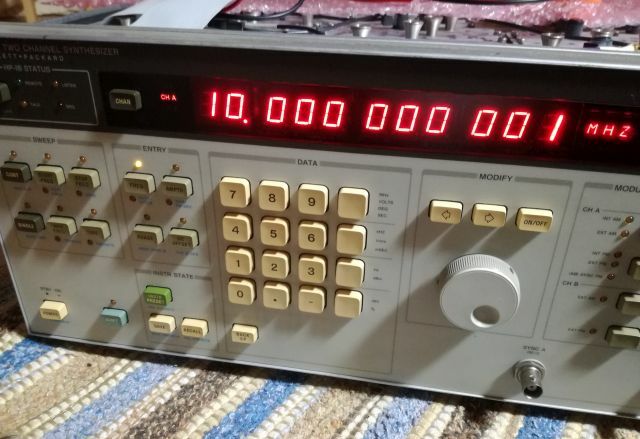 So my first assessment was, this unit needs replacing, and I found a replacement part online, from a US seller, not cheap, but OK, the 8561E analyzer is worth it, if it is working again after the repair. 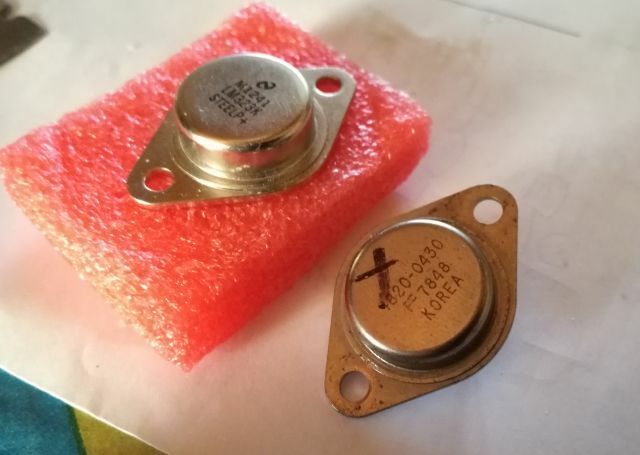 Unfortunately, several week of waiting were all for nothing – the seller shipped the wrong part and it took a while to get the money back, but finally all settled, except, we still have the defective filter. 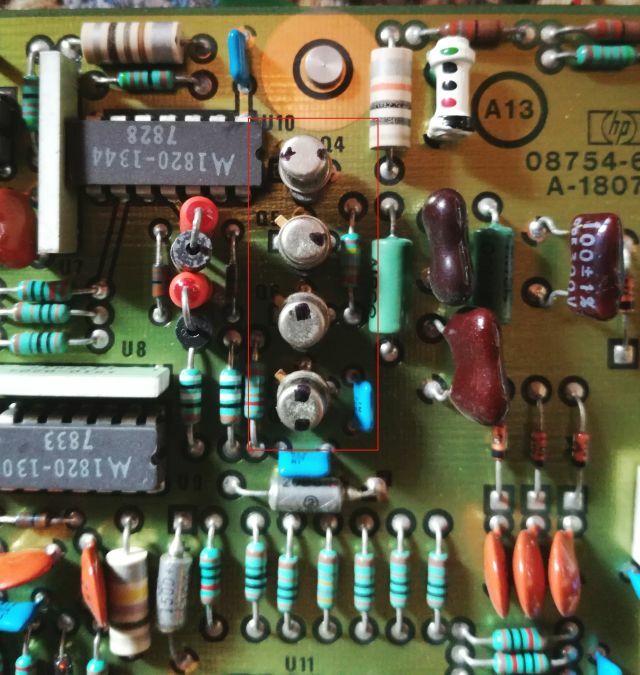 Let’s try to investigate the nature of the defect, and open it up. 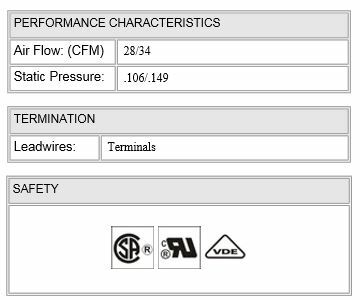 Fortunately, these filters are not hermetically welded like some other YIG parts. 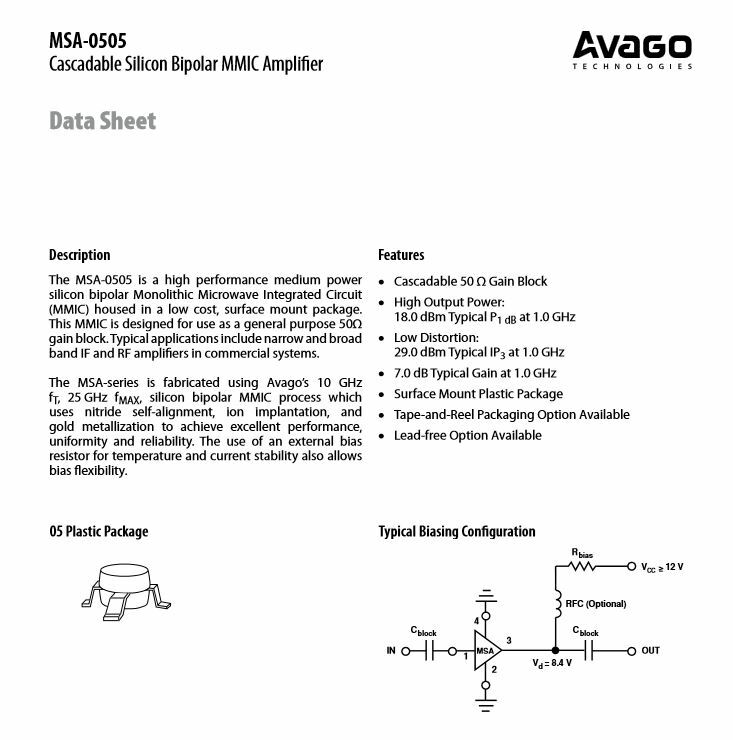 You can clearly see the coil, the inlet and outlets (low and high band) by rigid SMA cable (1 mm size!). 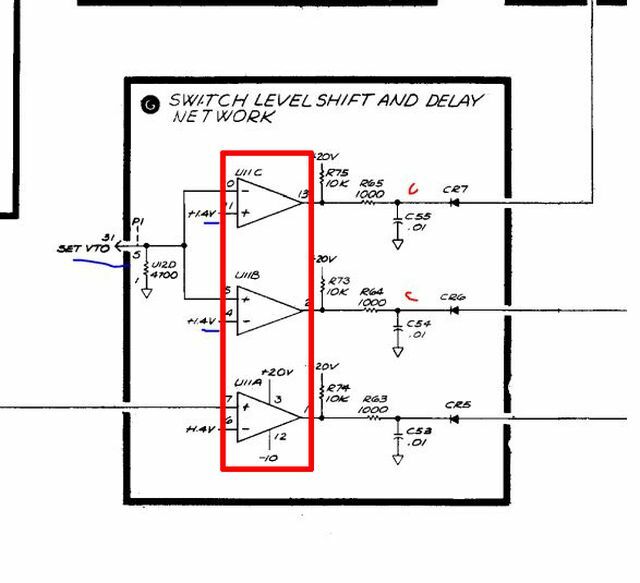 First, let’s study the switch. 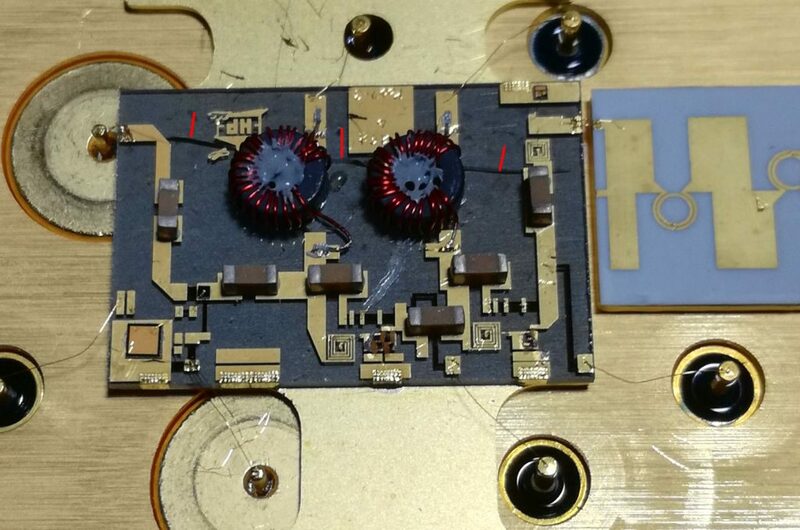 It is not actually switching the high band, as I originally assumed, but it is switching on and off the low band. 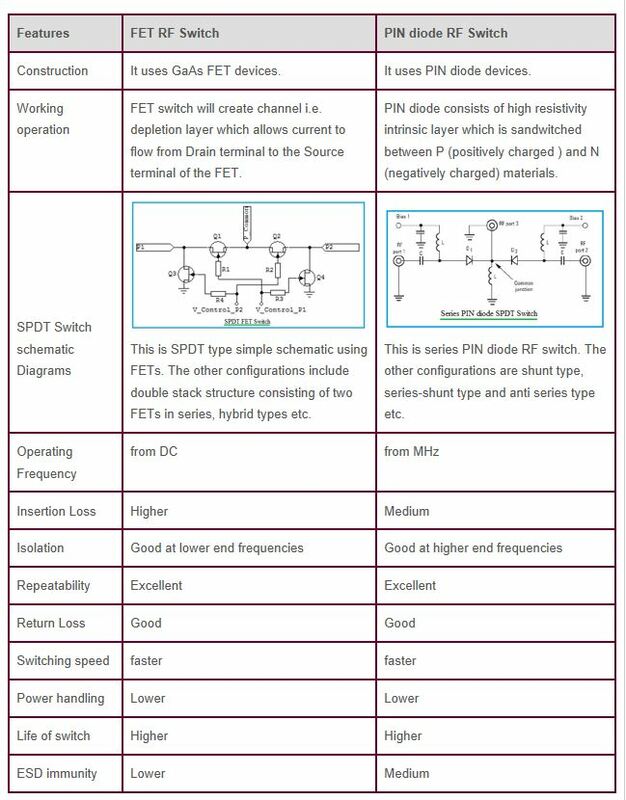 It is a series-shunt-series type FET switch, controlled by about -10 V negative voltage (1 kOHM vs. -15 V connection is the usual control method, floating or ground to switch off). 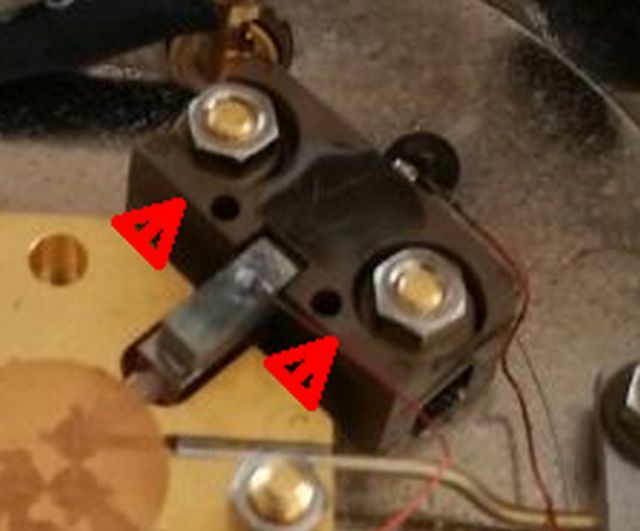 I could not find the exact die and model for this switch, but there are many similar models that clearly show the structure. 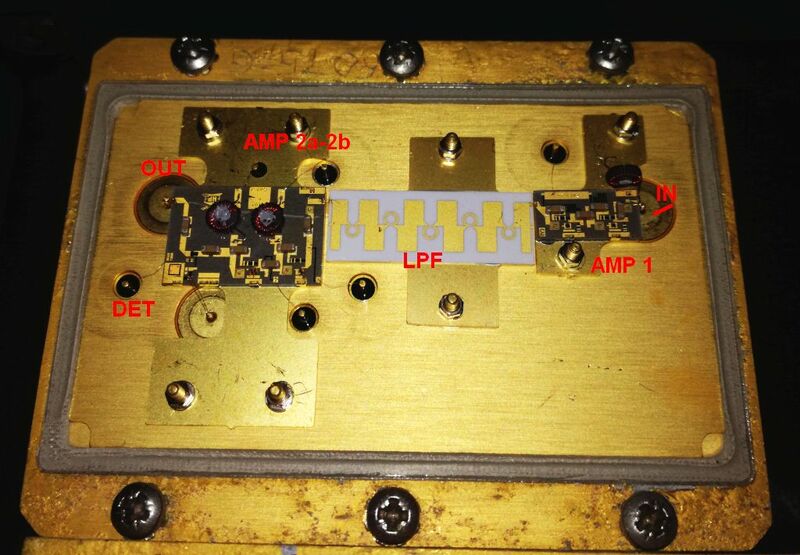 The shunt and double series construction will provide very high isolation. 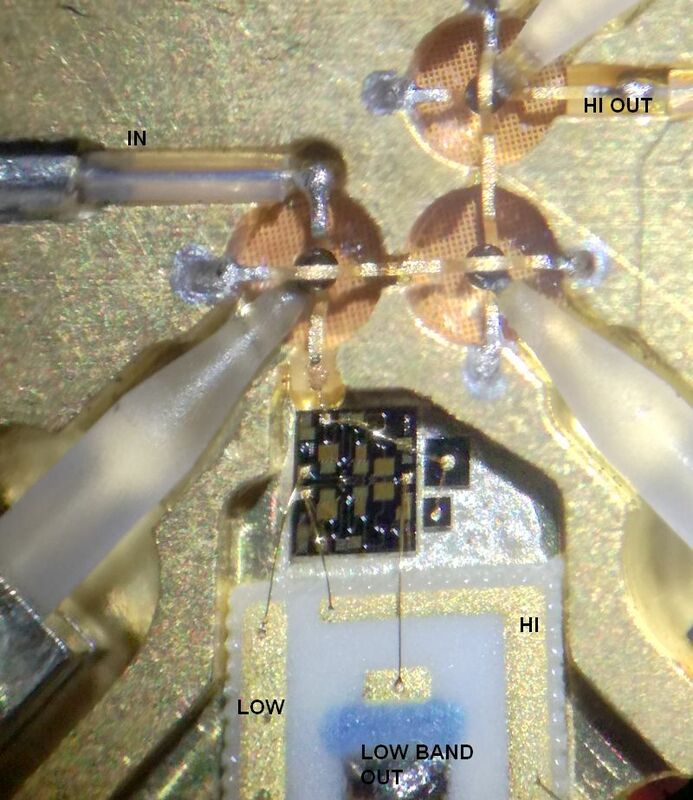 After removing carefully the gold mesh (it is only lightly glued on, I will use some tiny traces of epoxy to stick it back on), some study under the microscope. Clearly, the spheres are misaligned! 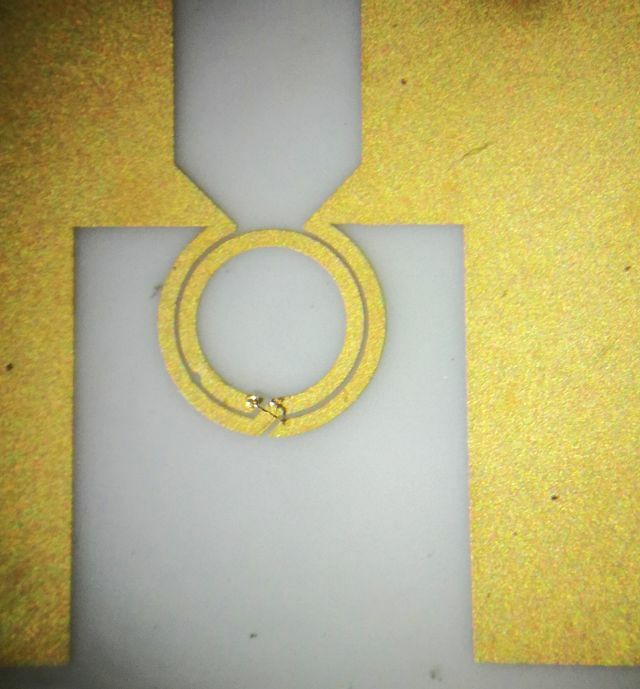 The spheres must be placed in the center of the coupling loop, to allow for RF to couple. 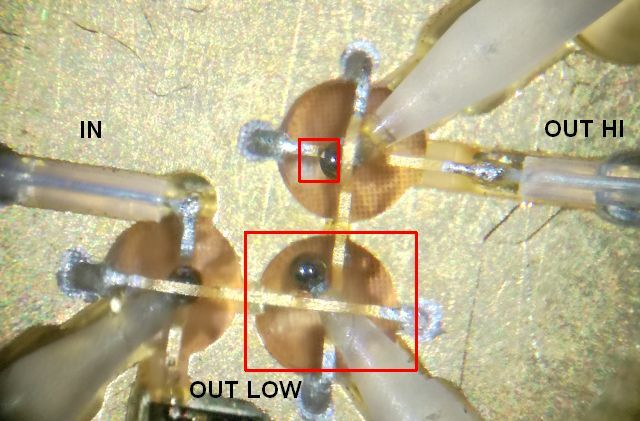 Generally speaking, during alignment, the sphere is only turned, and then the position fixed by some epoxy – which all seems to be intact, and solidly fixed. So what has happended? 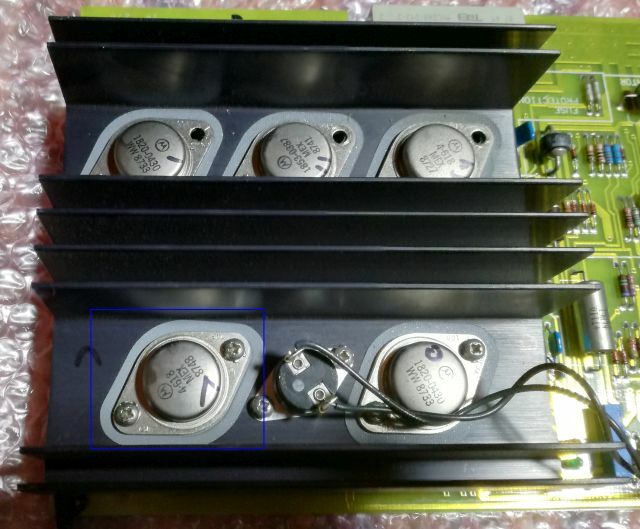 I think it has to do with the mounting blocks, which are of different material compared to the based (which needs to be magnetic Fe-Nickel alloy). 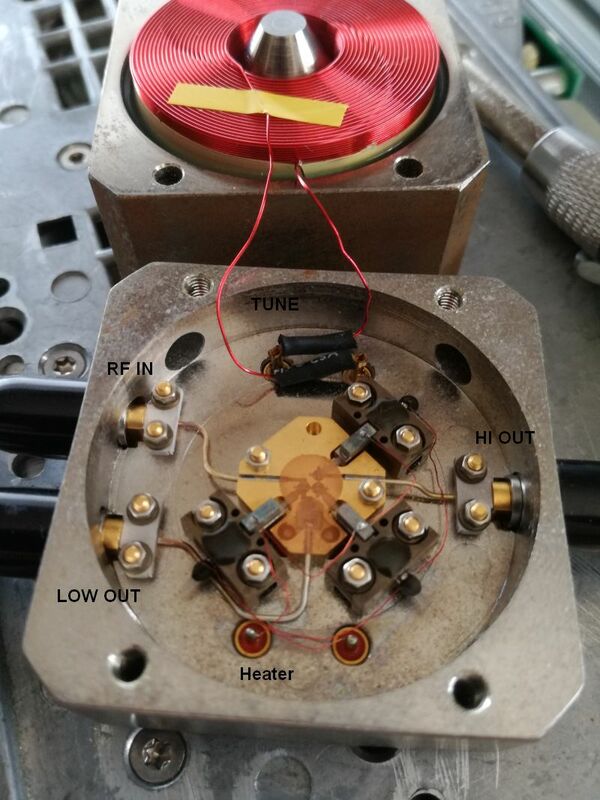 With frequent temperature cycling, I believe there is some migration of the mounting blocks, fractions of a micrometer every time (keep in mind, the YIG spheres are heated during operation). While we can speculate about the reason of the migration, the result is clear, and the action as well: we need to realign the spheres. 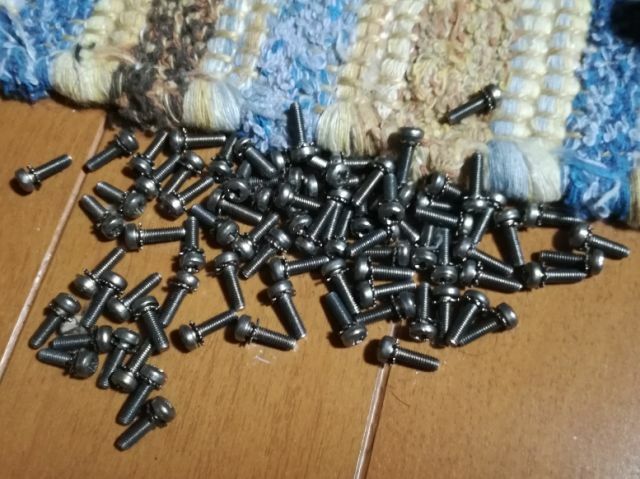 I decided not to undo the screws because the coupling loops can be easily damaged, and used a screwdriver to carefully push the mounting blocks away from the coupling section, bit by bit, under control with a microscope. Finally managed to get all the sphere properly aligned. 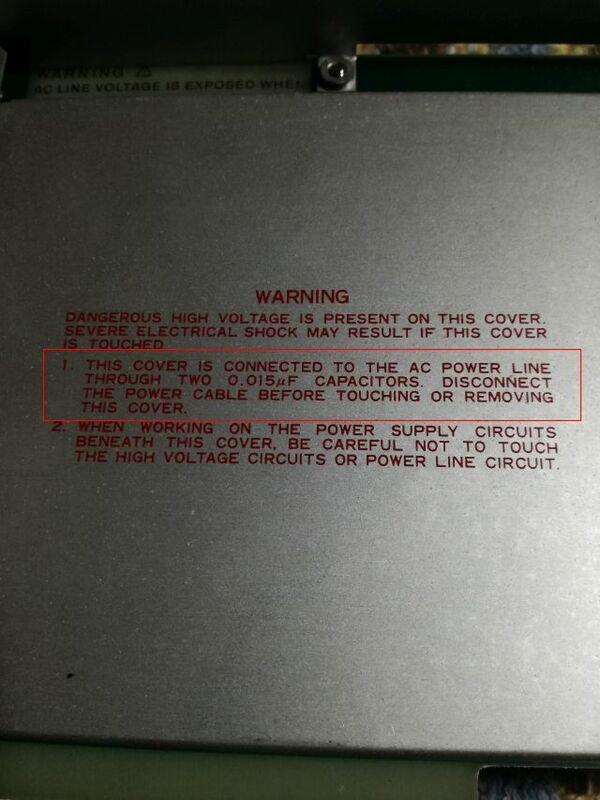 If you don’t know how it works, never turn the YIG spheres! 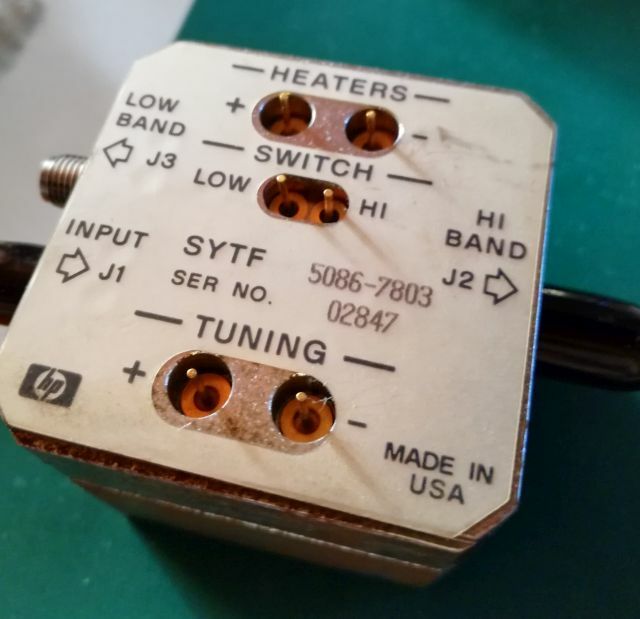 These need to be aligned for thermal stability effects, not only amplitude – something which you may have trouble doing at home. 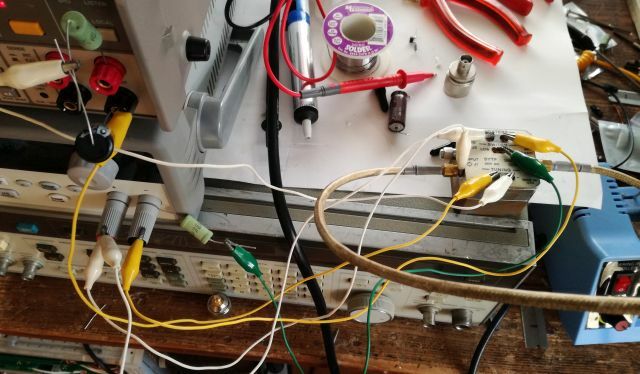 After all the alignment, a quick test setup, with a current source for the main coil, and another supply for the heater and switch connection. 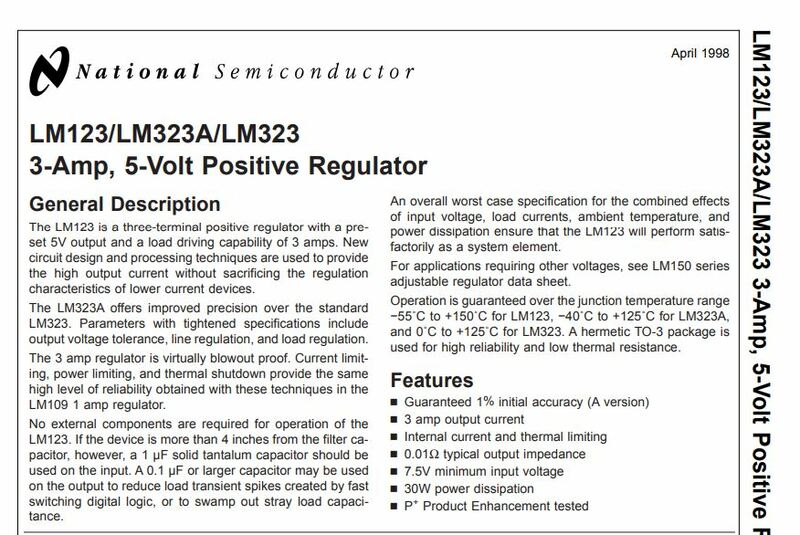 Note that the current source is set in parallel with a capacitor (22 uF) to allow for stable regulation with the strongly inductive load. 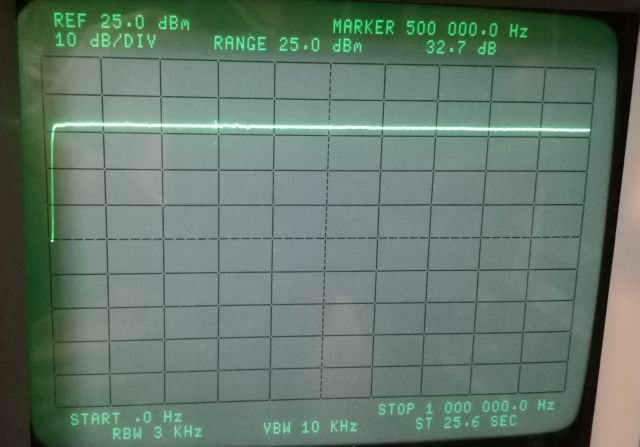 The insertion loss test – done by checking at several frequencies, using the lines of a good comb generator. 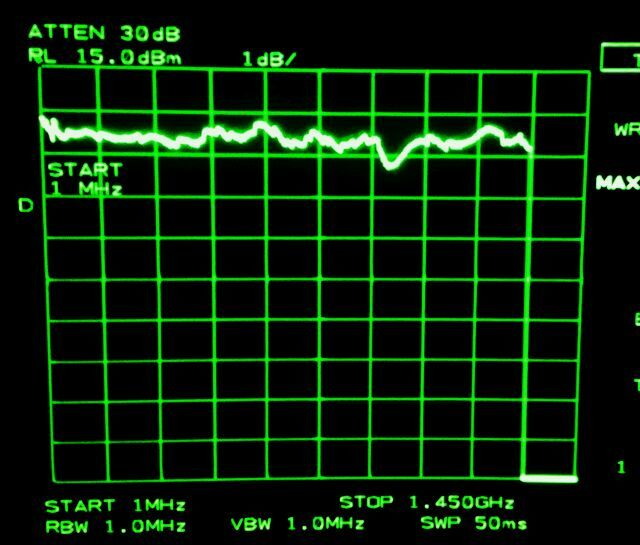 The insertion loss, in my simple setup, it is about 4-6 dB for a 3 stage filter, not bad. 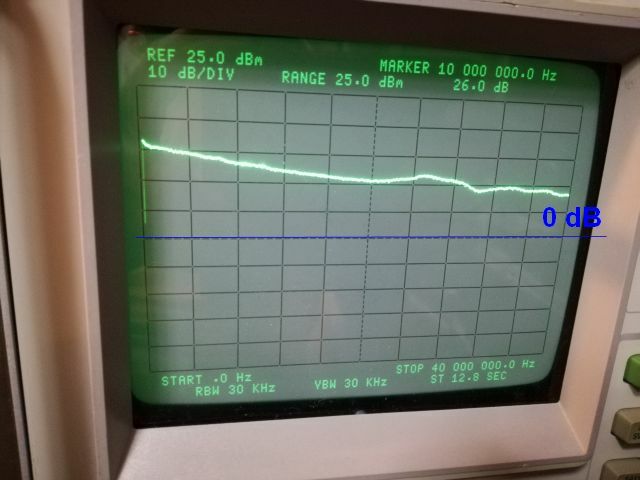 I don’t know the original performance spec, but it is definitely in the typical range of such filters, and good enough for a spectrum analyzer in any case (in the worst case, we will loose 1-2 dB of sensitivity). Maybe I will eventually find a new filter at a reasonable price, to check it – it could also have moved spheres. 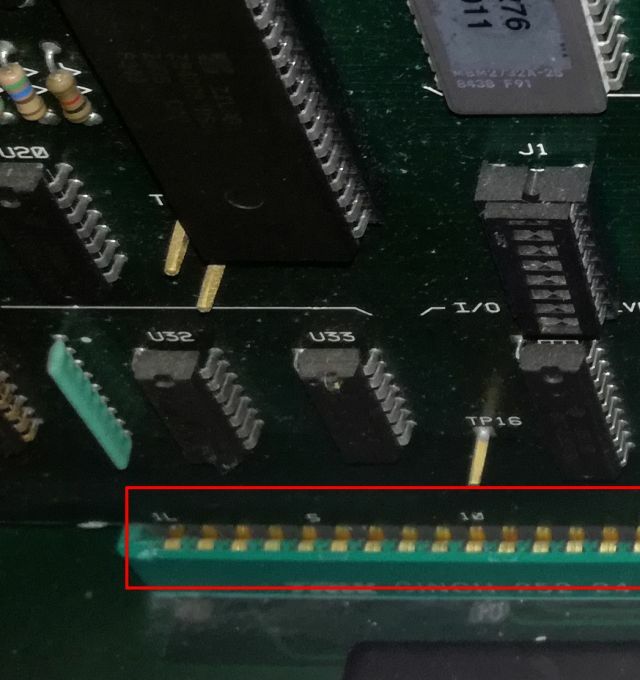 The tuning current is very linear, I don’t expect any issues with using this part in the analyzer (the tuning characteristics can be programmed and stored in the EEPROM of the analyzer, to control its DAC appropriately, also, we will need to recalibrate the flatness). 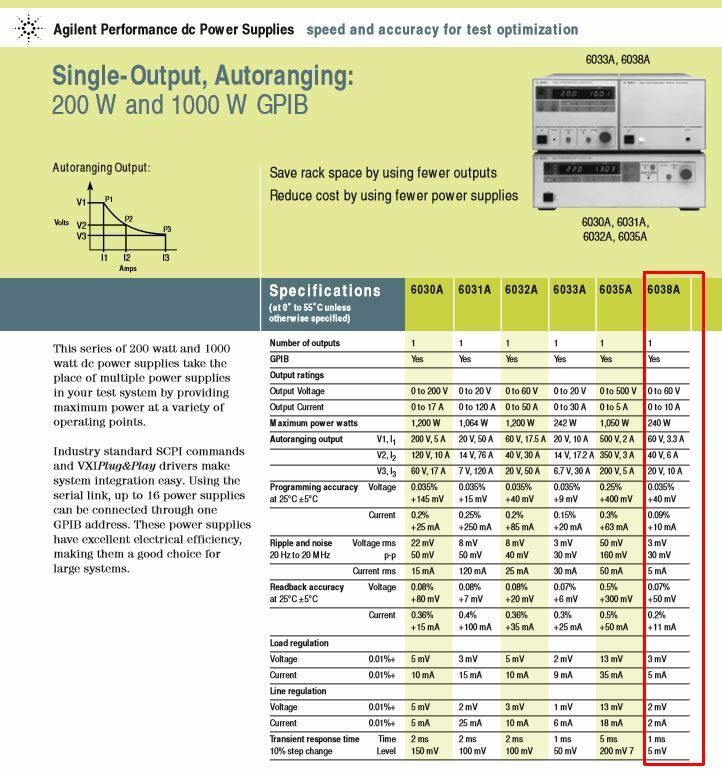 The 6038A is a very capable switchmode power supply, which features great reliability, 10 Amps of current, up to 60 Volts, and 200 Watts – for the regular unit. 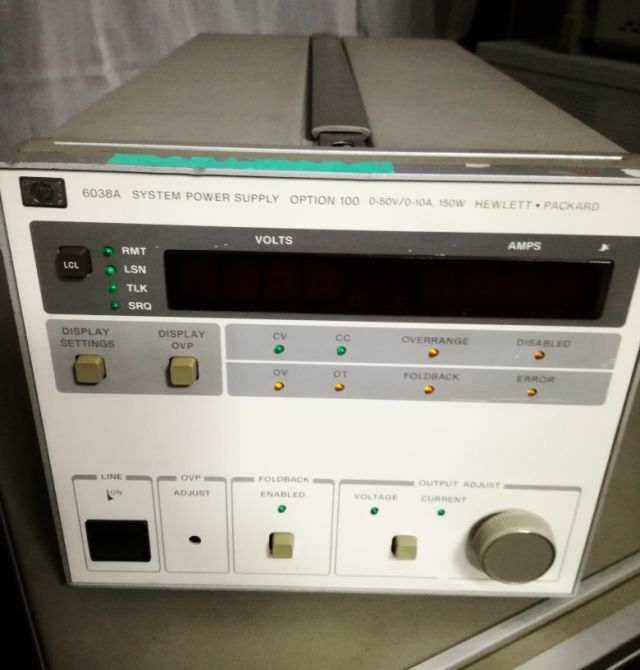 The unit discussed here is an Option “100” unit, this means, it can work here in Japan, with 100 Volts AC mains voltage (50 or 60 Hz, depends on where you are in Japan…) – at 75% of the rated power, say 150 Watts max. 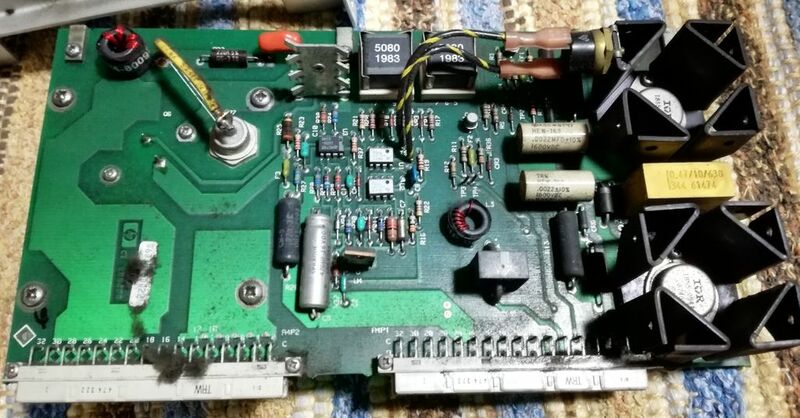 Well, 150 Watts is fair enough for my purposes, and I got this unit for next to nothing, “doesn’t power on, blows fuse”. 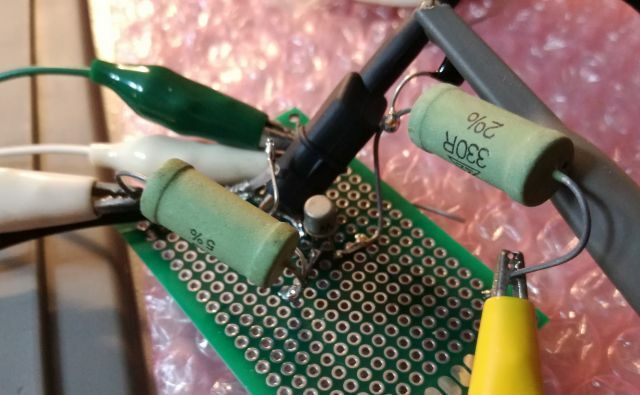 Indeed, the fuse was blown. 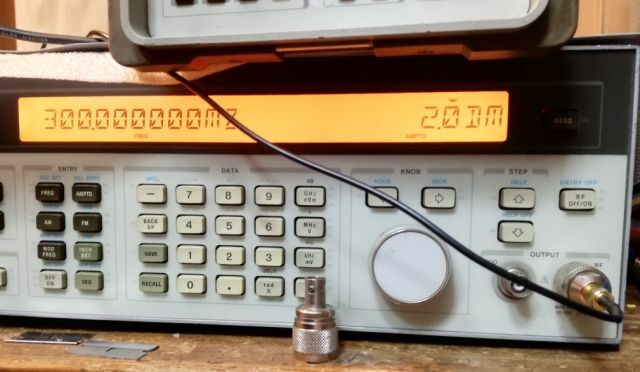 An it has low resistance when measuring across the mains. Difficult to find the issue. 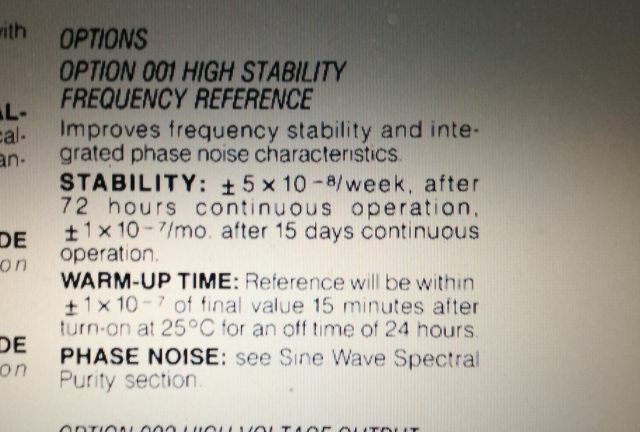 Looking at the datasheet, it is definitely worth the repair. 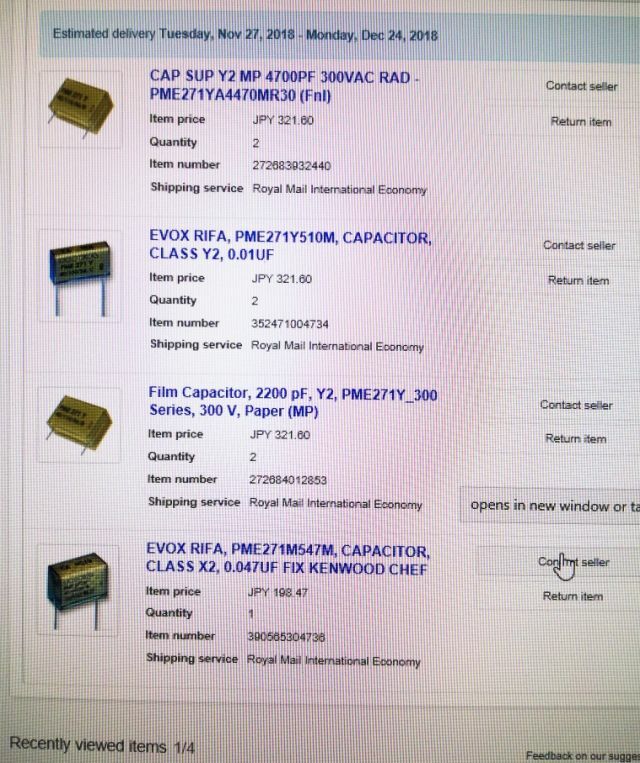 New, it was around USD 3000 list price (maybe more like USD 5k in nowadays dollars)! 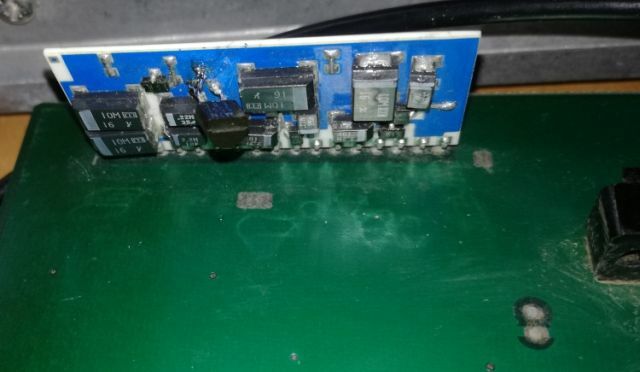 Somehow, I could not find anything wrong with the power board. Maybe a short on the main board? 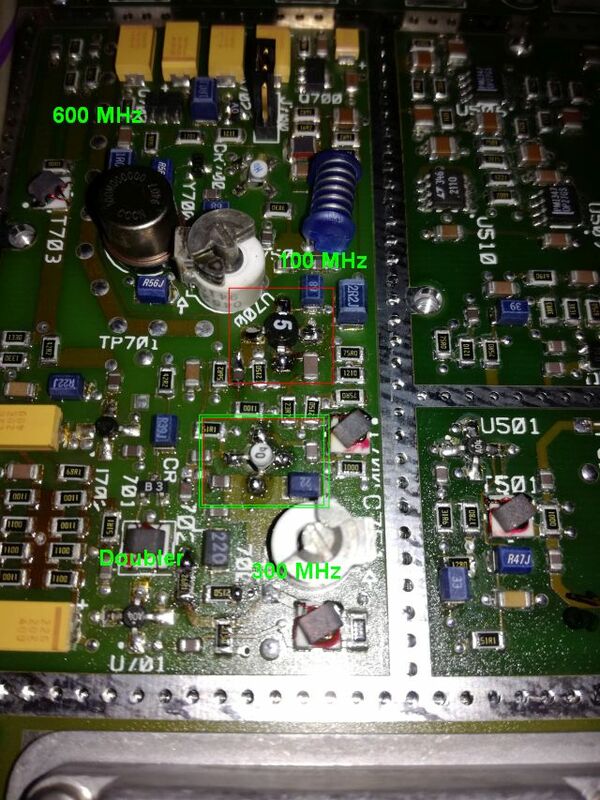 That’s the main power board – checked all components, no issues, no specific signs of heat or excessive aging. 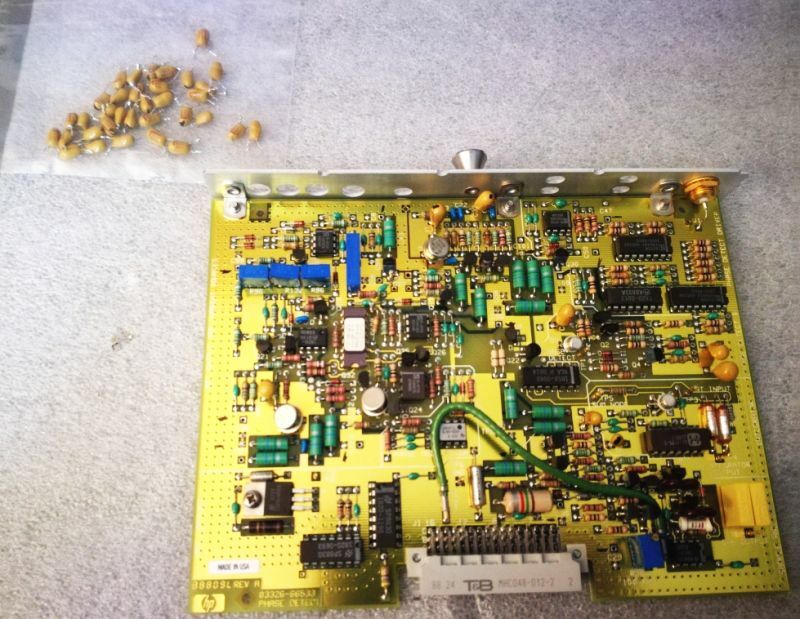 Anyway, we have to take this thing apart for thorough cleaning. Finally, after a lot of probing – the short disappeared. How can it be? 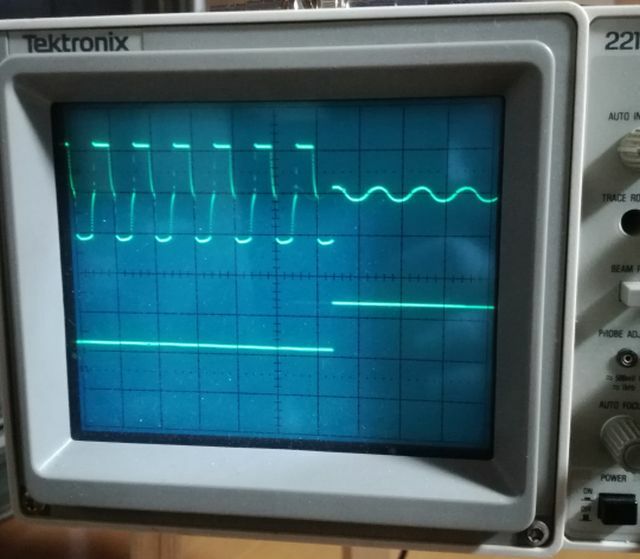 After even more probing – it turned out that the fan (!!) had a hard short. 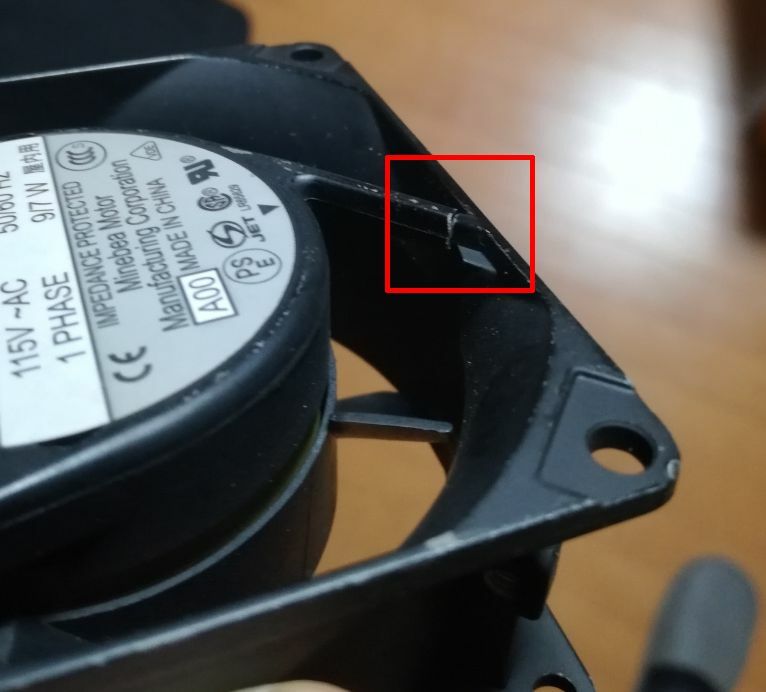 This fan is a SU2A5 fan, quite common in HP equipment of that time, but pretty rare and expensive nowadays, and I really don’t want to fit an old fan, but rather a new part with new bearings. 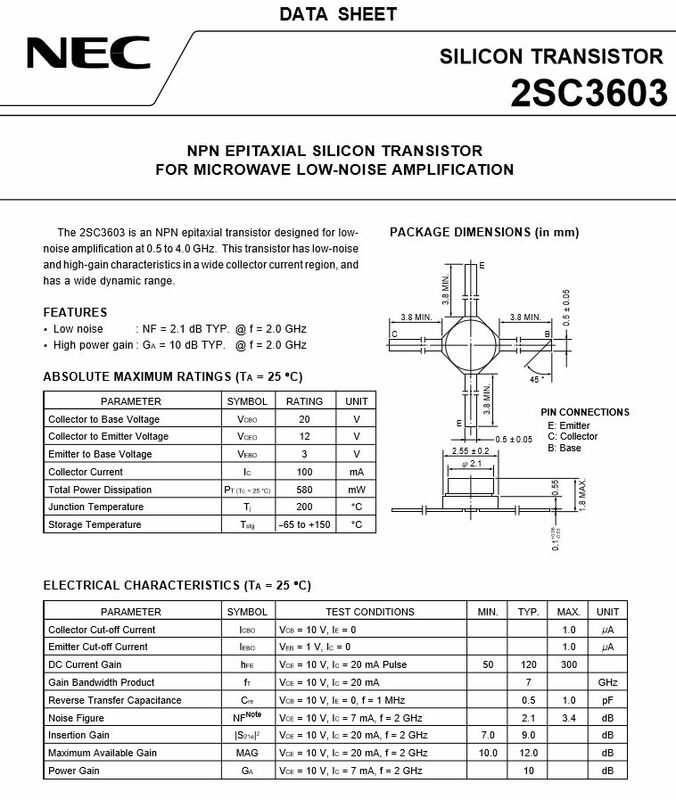 After quite some study, I found a good offer for a NMB B30 fan, which is quite similar. 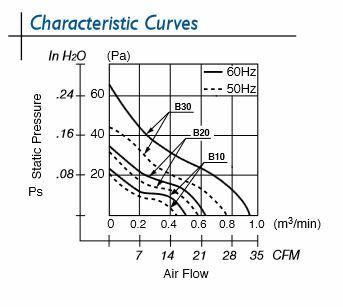 Best to compare not only the numbers, but the full pressure vs. flow curve, because the instruments has many cavities and corners, so the flow resistance can be quite substantial. 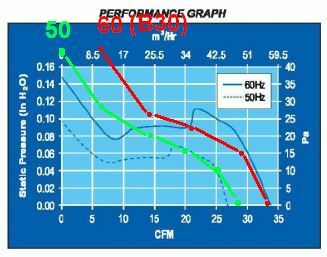 But as it turns out, the B30 design is a high pressure fan, it will meet or exceed the performance of the original part. 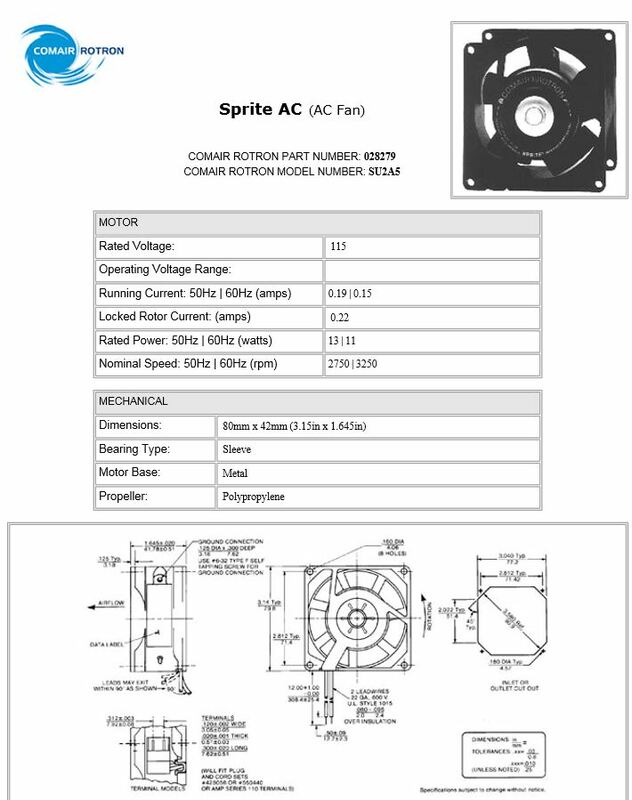 Now, we have to wait for the delivery of the fan – at least, I tested the supply without the fan, and it does work and start up. 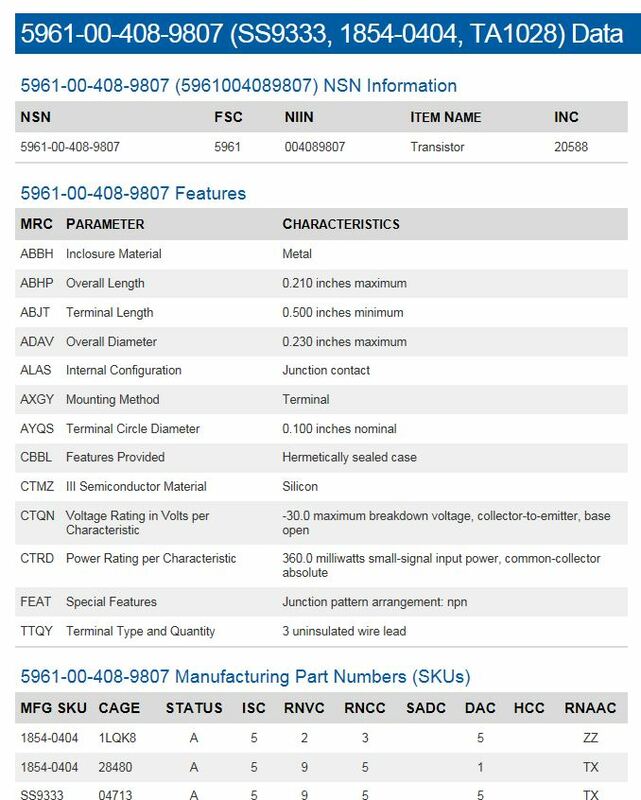 So it is confirmed, the repair will be worth the effort. 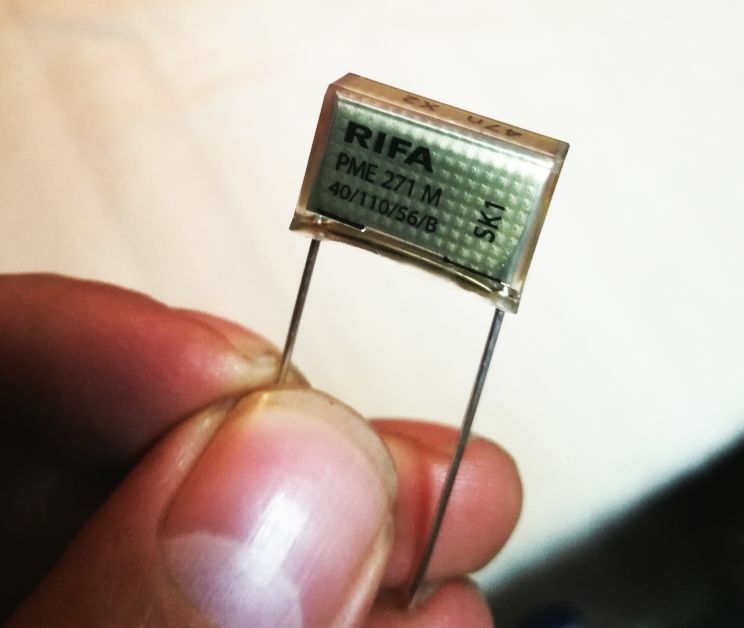 Additionally, all the X and Y rated capacitors are RIFA type, of the cracking epoxy-coated series. They will all need to go, and will be replaced with new RIFA caps – hope they have improved the design – at least, these will last another 20 years. 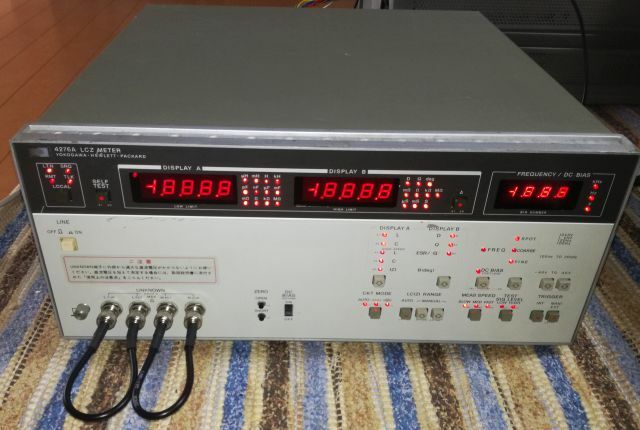 The HP Yokogawa (Made in Japan) LCR meters are still very useful, these are 0.1% basic accuracy LCR meters – with various test frequencies from 100 Hz to 20 kHz. 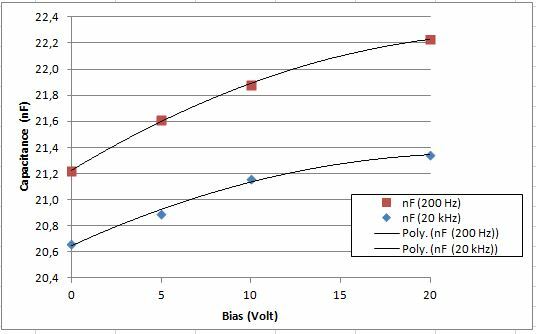 And, you can apply DC bias as needed to test ceramic capacitors, diodes, etc. 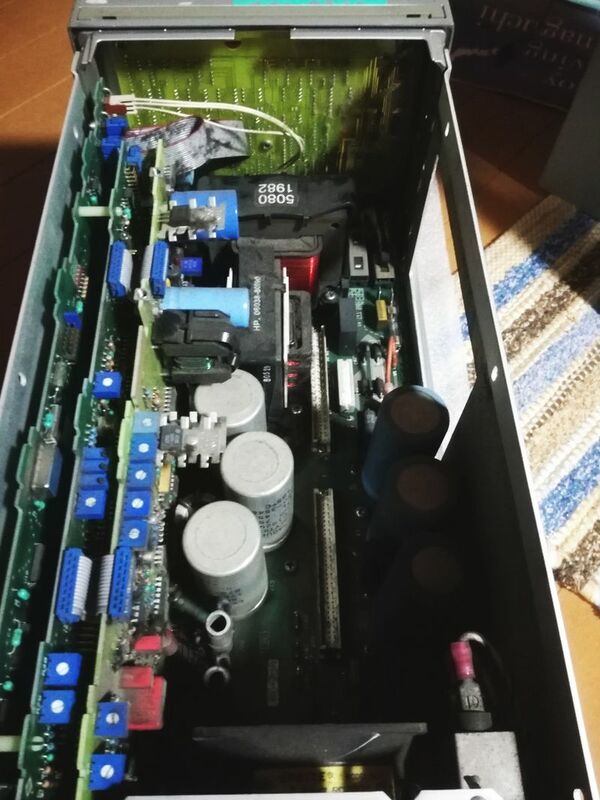 (1) Power supply seems OK, but the fan is not working. 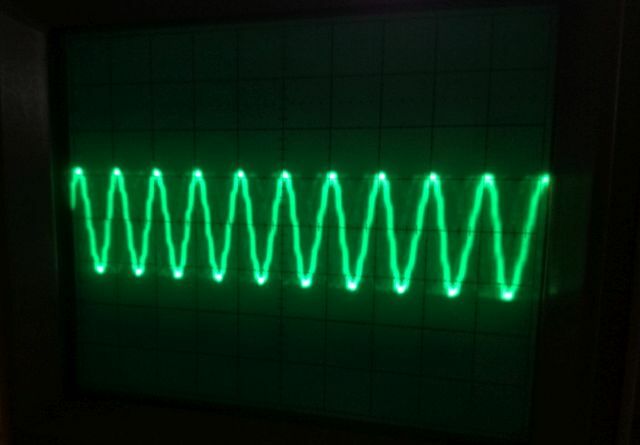 (2) Display shows overrange and self test shows errors in the analog circuit. In some ranges, I get a reading but it is far off. 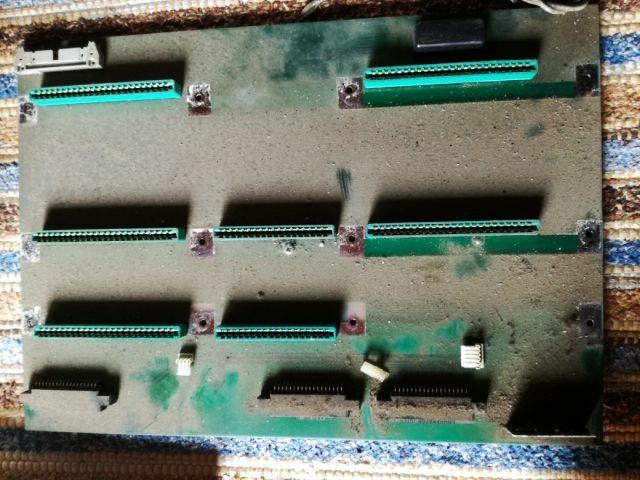 (3) Dirt, dirt, dirt – this instrument needs to be fully disassembled and cleaned, no doubt, and the front panel needs special treatment to remove all stickers and residues. 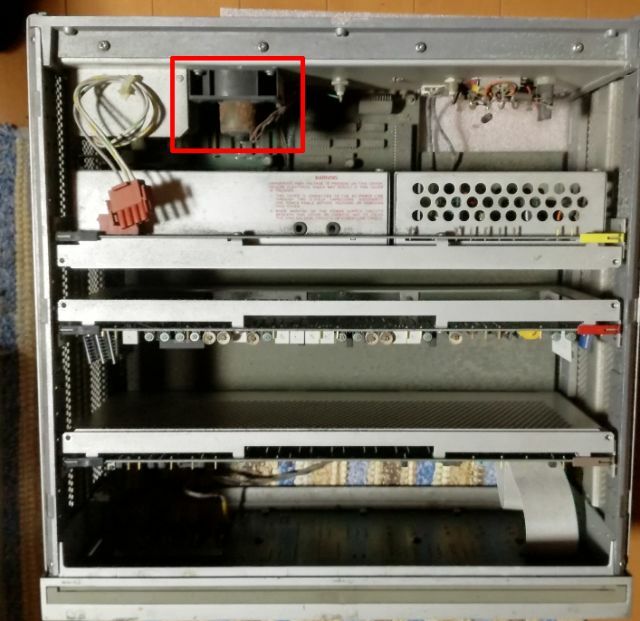 The top view – a lot of dust, and of the sticky kind. 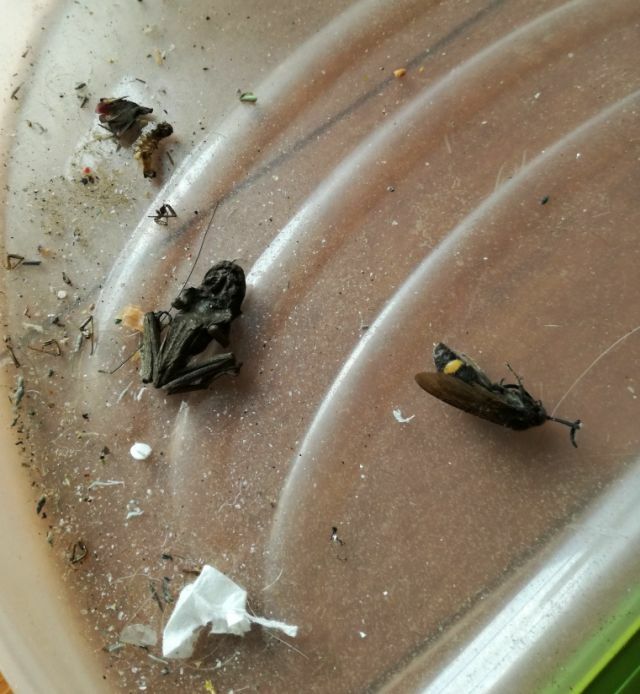 In the corners and gaps, a wasp, and a dried frog. Probably, this instrument has been stored in some shed? 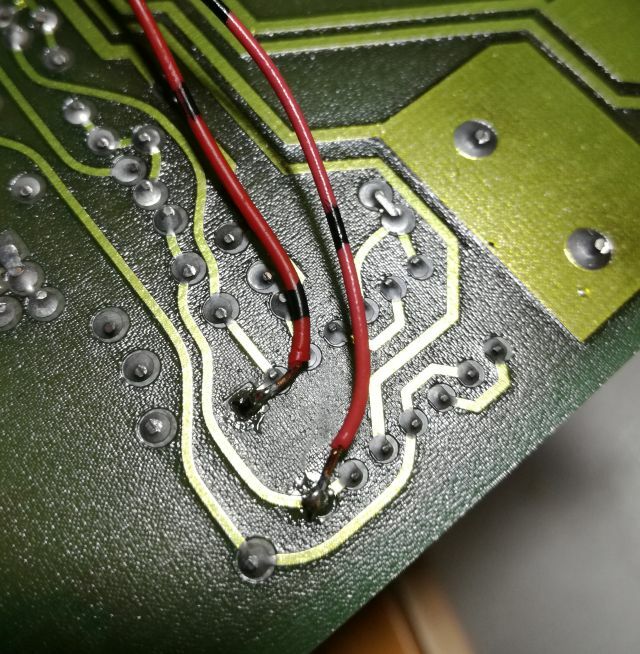 The main board – first, brushed of the dirt, then soaked it in 50% isopropanol. Take care of the fan hybrid, which is a thin ceramic plate – overall, a rather delicate construction. 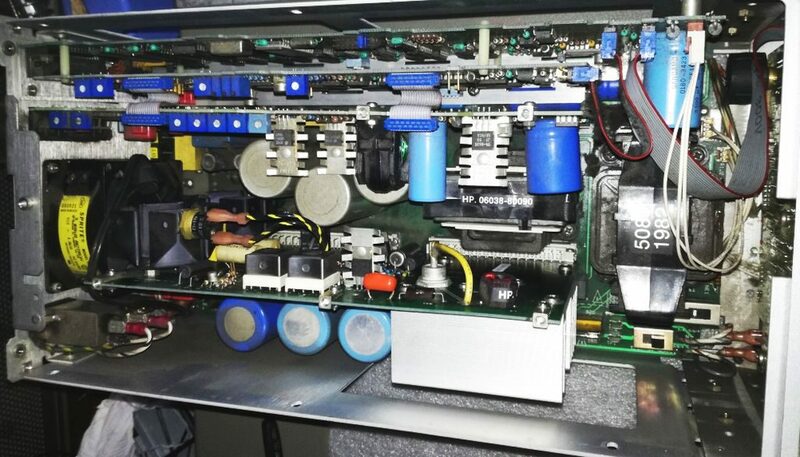 Not sure why they did’t just use regular components rather than a hybrid for the fan drive – there is a huge amount of unused space in the case! 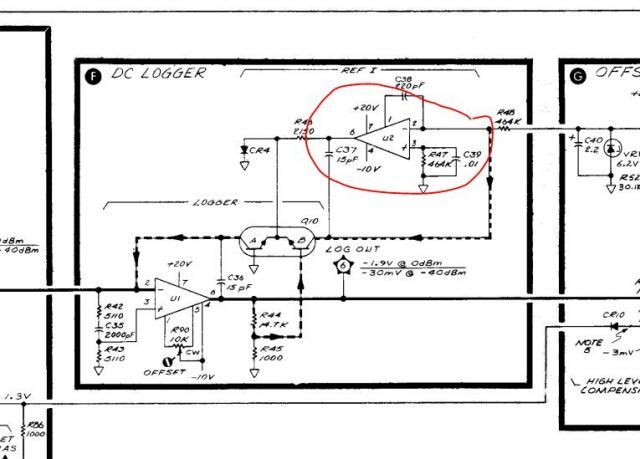 The fan, it is a brushless fan, Buehler, which needs an external driver to commutate the phase. 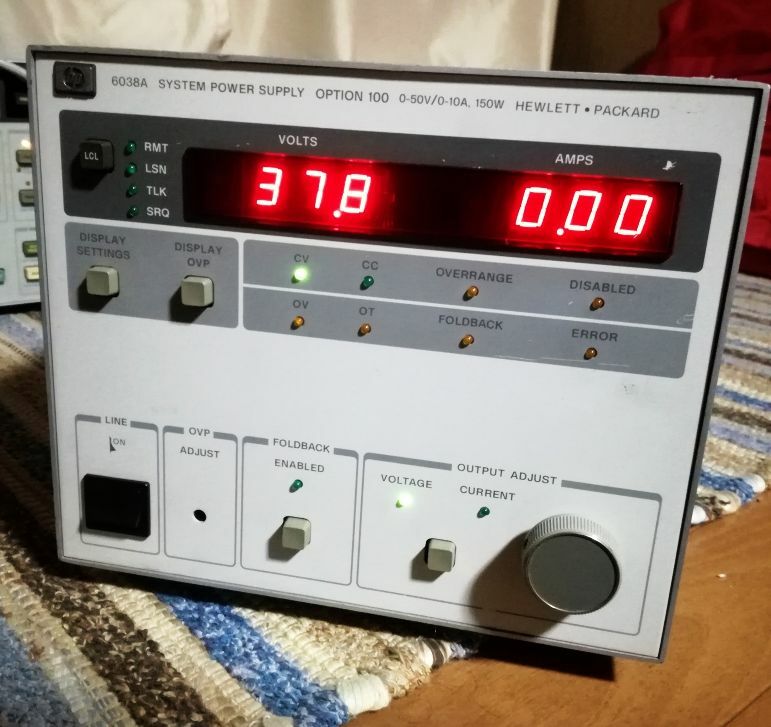 The test setup – with an external 8 Volts supply. 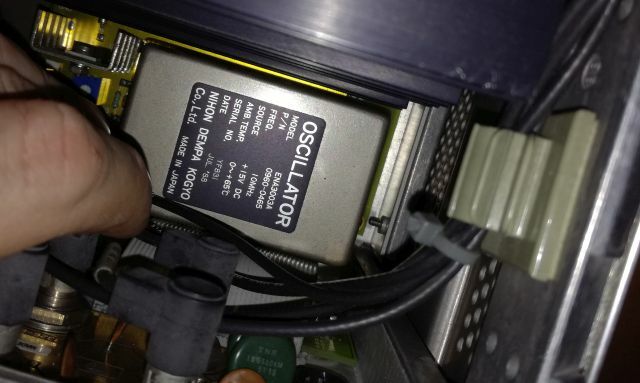 Turns out, the fan starts if we move it a bit. 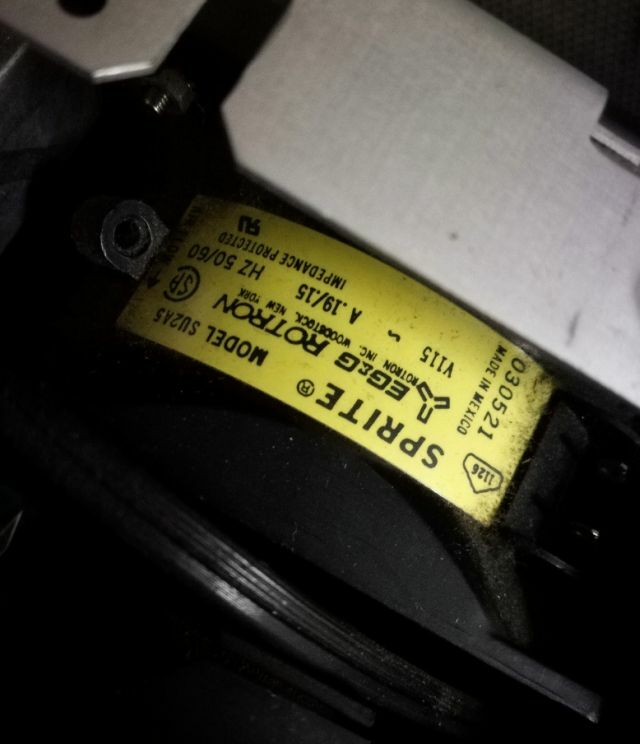 Probably, some issue with the driver. 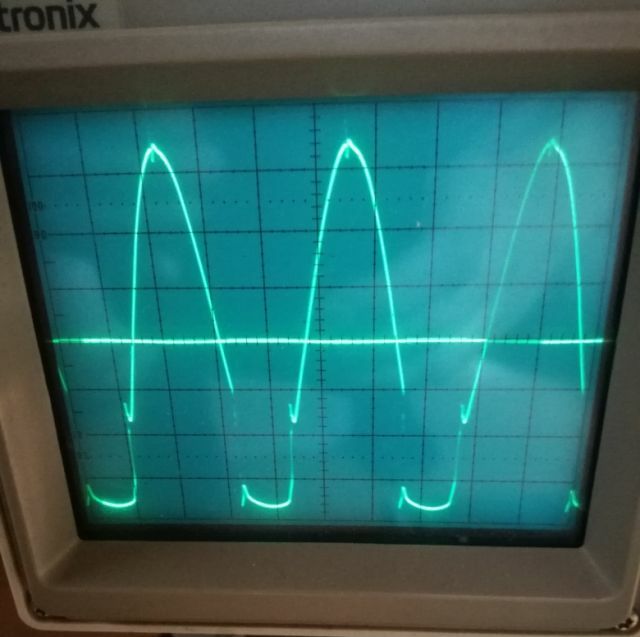 A good phase – you clearly see the switching action of the transistor, grounding the phase wire for some time to move the fan forward. 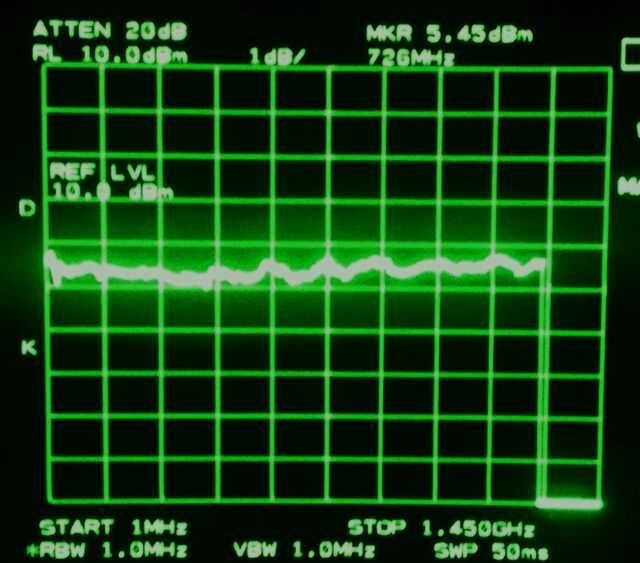 After some probing, it is clear that one of the 3 phases isn’t working! 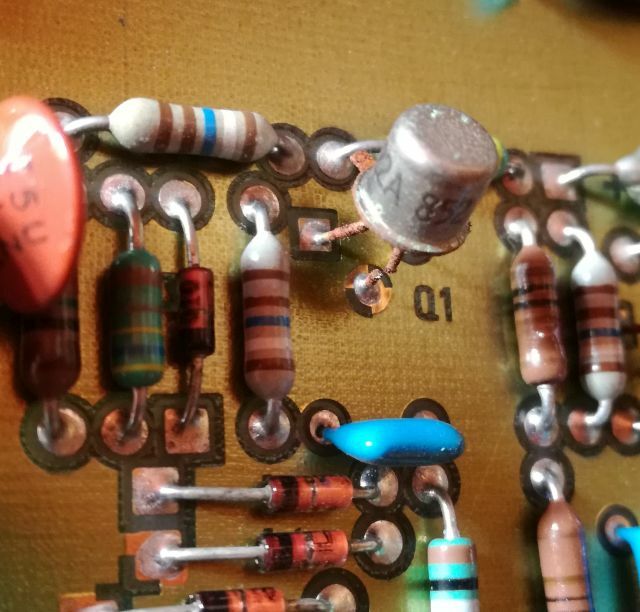 Tested all the timing capacitors of the driver – all good! 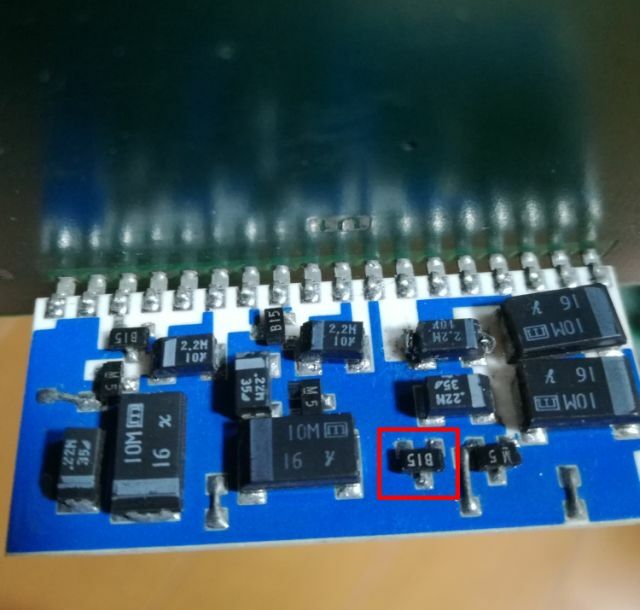 But – one of the transistors, SMD, marked “B15” is not OK! 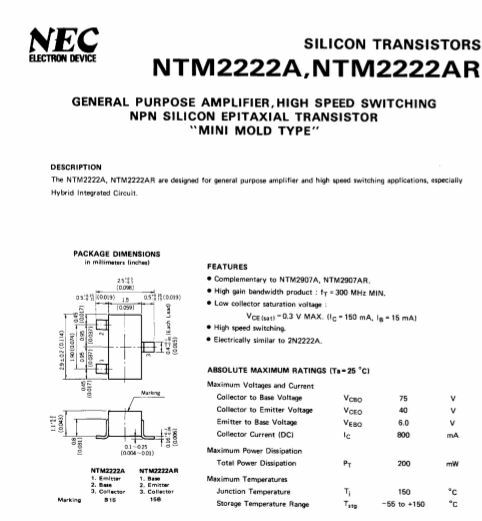 B15, this is a 2n2222a equivalent transistor – watch out, there are different pinouts. 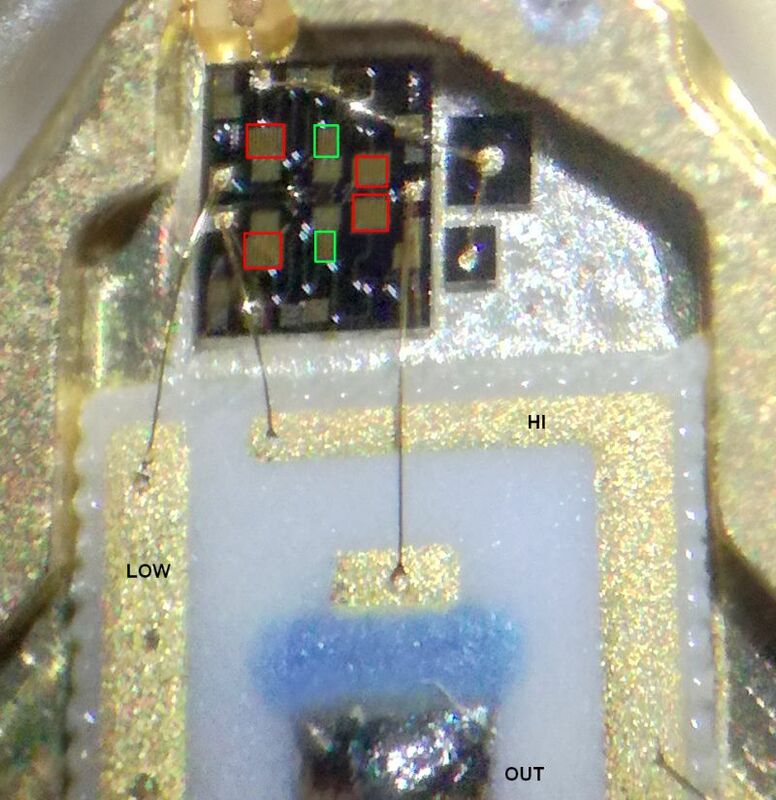 Unfortunately, I had no SMD NPN transistor of suitable kind at hand, so I soldered in a 2N5551, for test purposes. 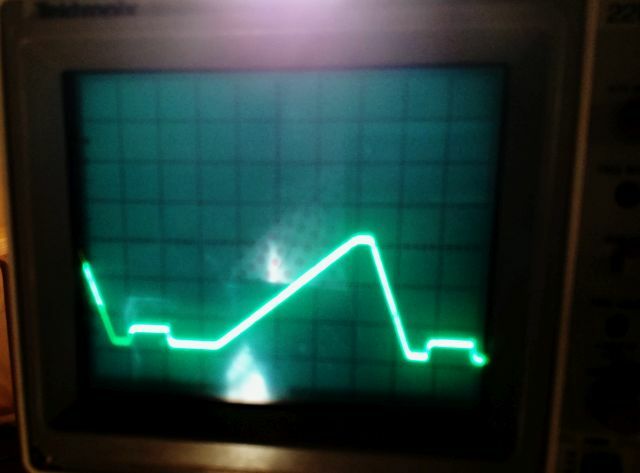 It is working – the transistor has a bit less strong/fast switching action, but no problem, the fan is working again! 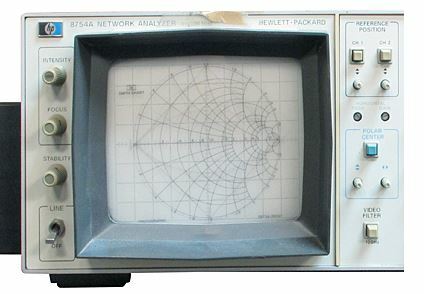 Next – we have to fix the analog circuit. 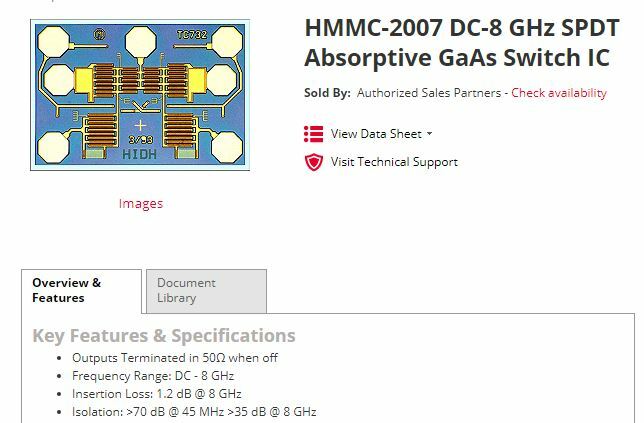 This is a nice board, with several hybrids. 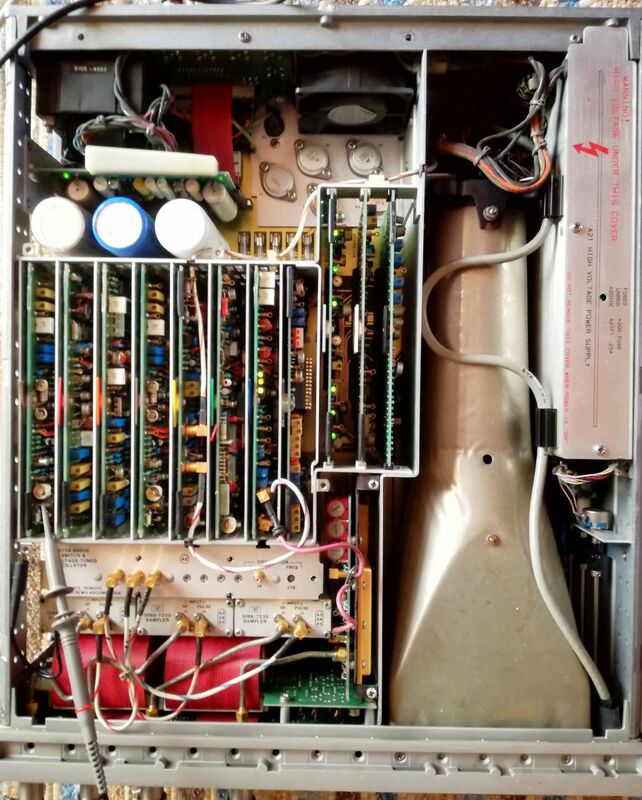 First, we check the power supplies – HP designed this to have all individual +-12 Volt regulators, for each sub-section (all sections are nicely labeled, and clearly identified). 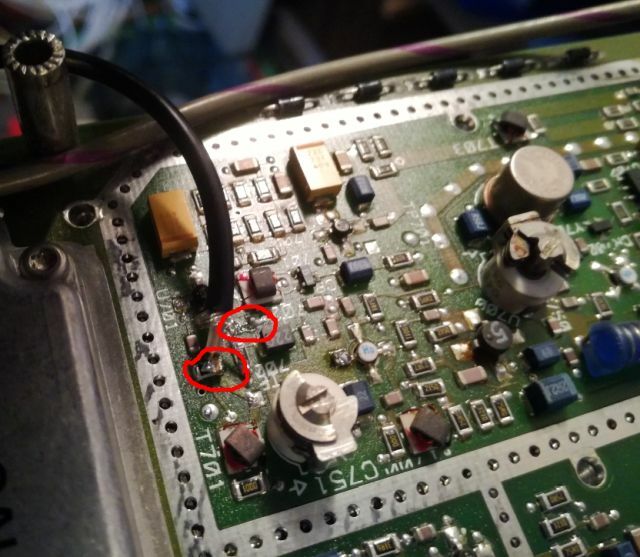 After some difficult probing – found one bad 12 V regulator! 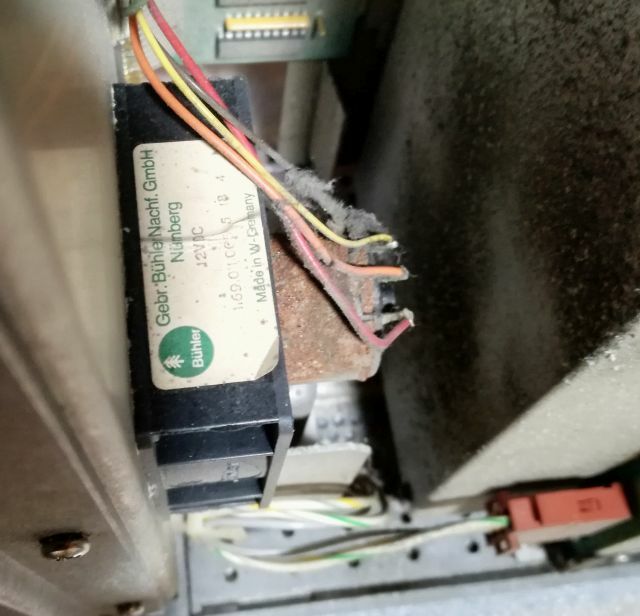 It even had some traces of corrosion – maybe it was running hot or some other failure. Some test – still not working – at least not in all ranges. 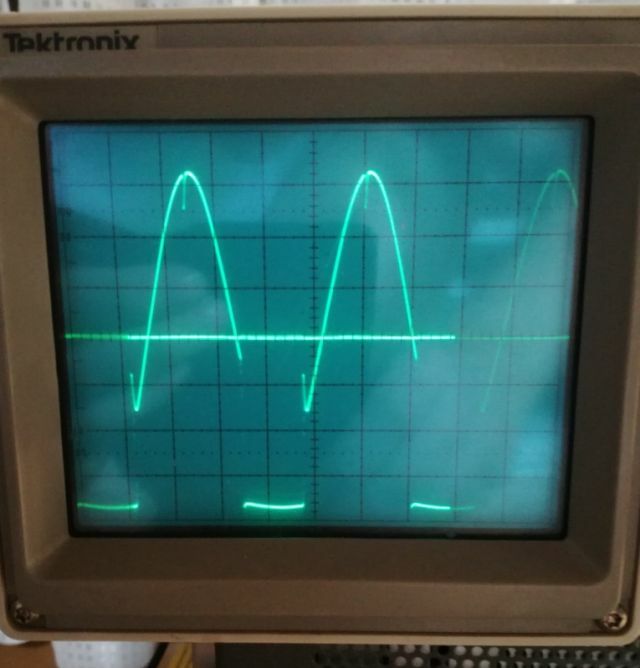 Seems the input amplifier is clipping the signal. 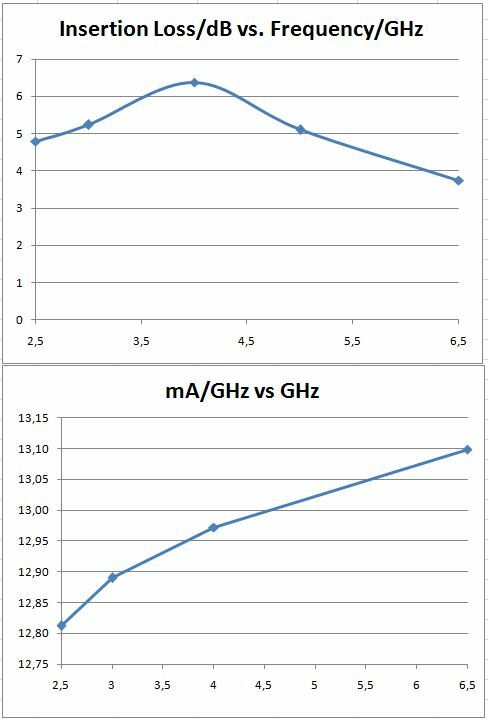 Clearly, something is wrong with the range switching. 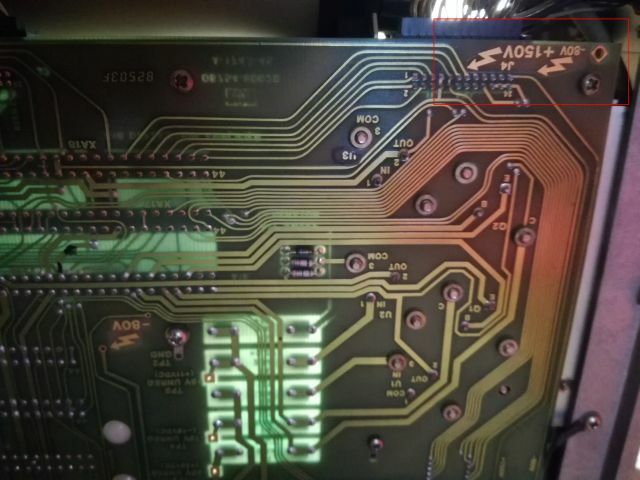 … about 1 hour later, traced the signal back to the range selector logic, one bit is not getting through – it got stuck at the edge connector of the CPU board – the edge connector shows some residue and oxidation. Cleaned it thoroughly with an eraser, and alcohol. 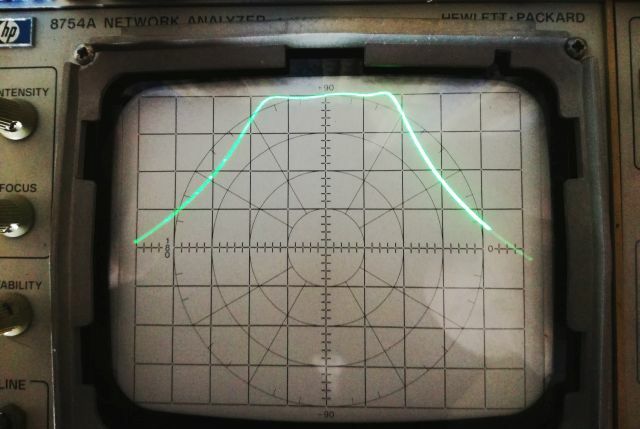 … testing a 22 nF capacitor. 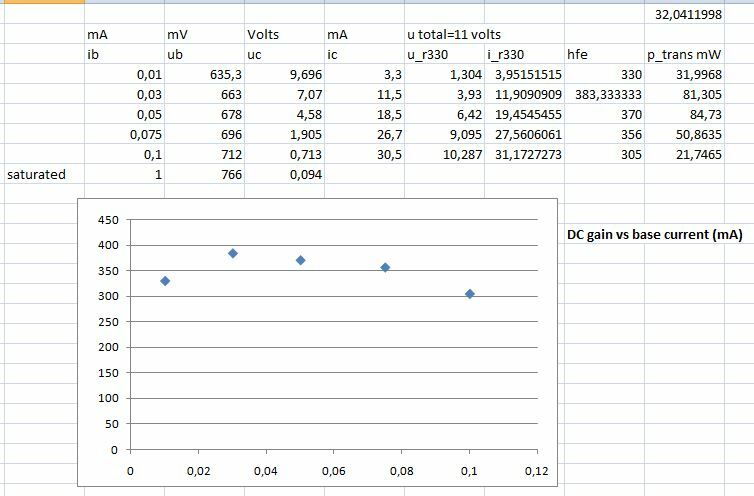 It is a really great instrument to test ceramic capacitors, and the impact of DC bias on their capacity! 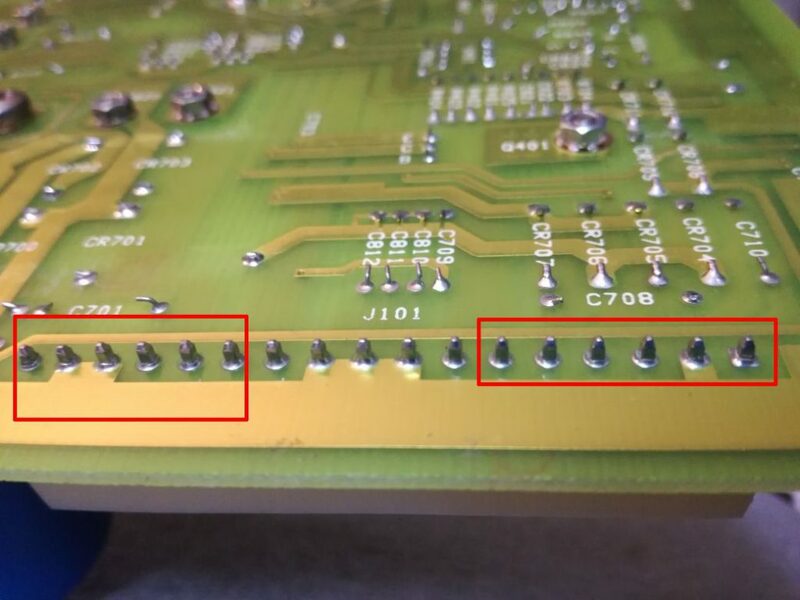 As a last measure, inspected all the X and Y rated capacitors – it good practice to do so with any old instrument. 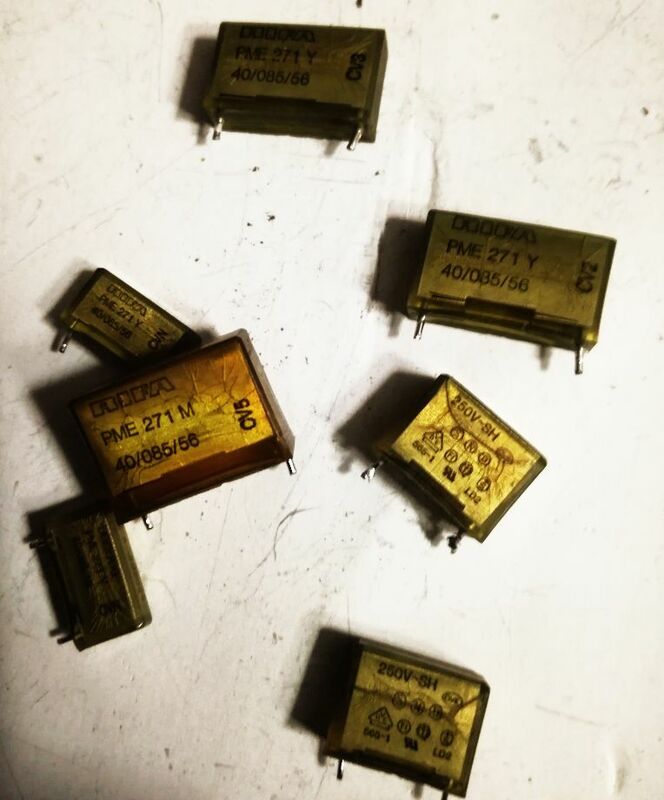 These are safety capacitors, and they often fail with age and use. 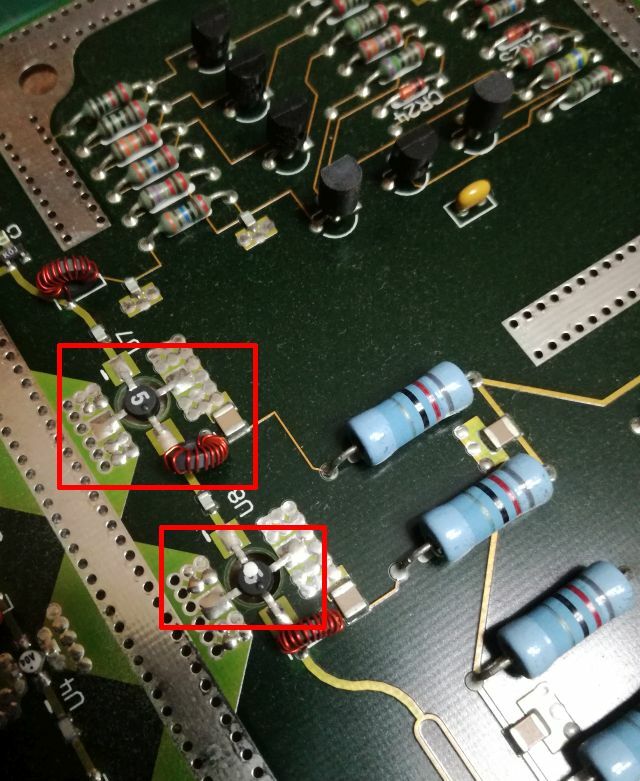 The power supply cover is connected to the mains with a Y rated capacitor, and these don’t look good. 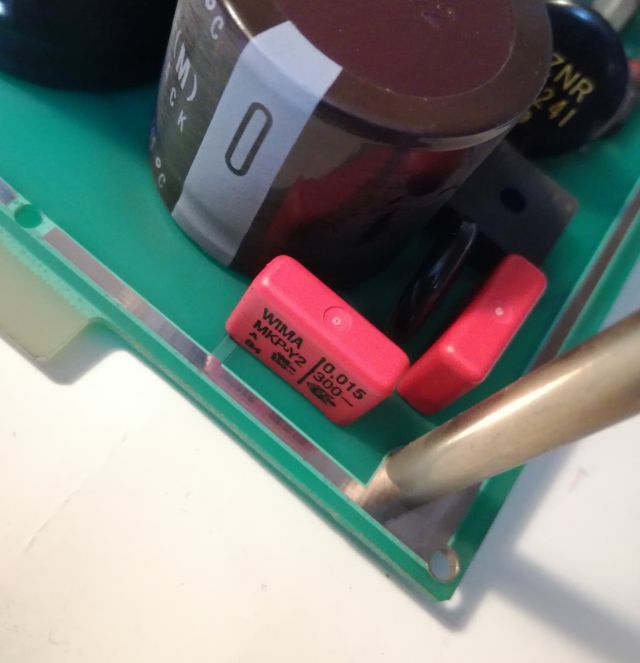 .. fitted new Y capacitors – feeling much safer now! 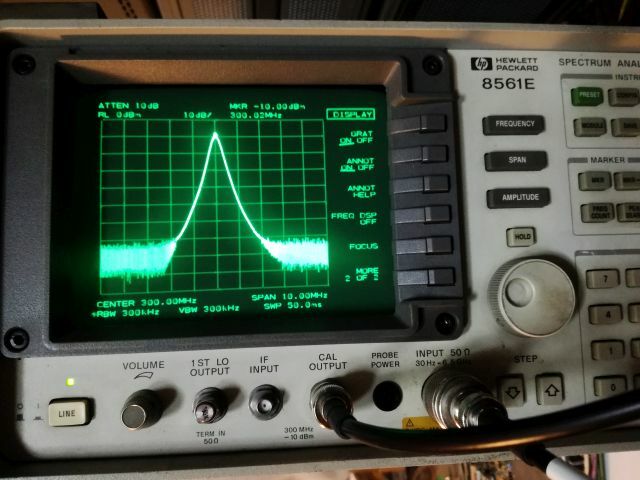 HP 8561E Spectrum Analyzer: 100/300/600 MHz system fixed! 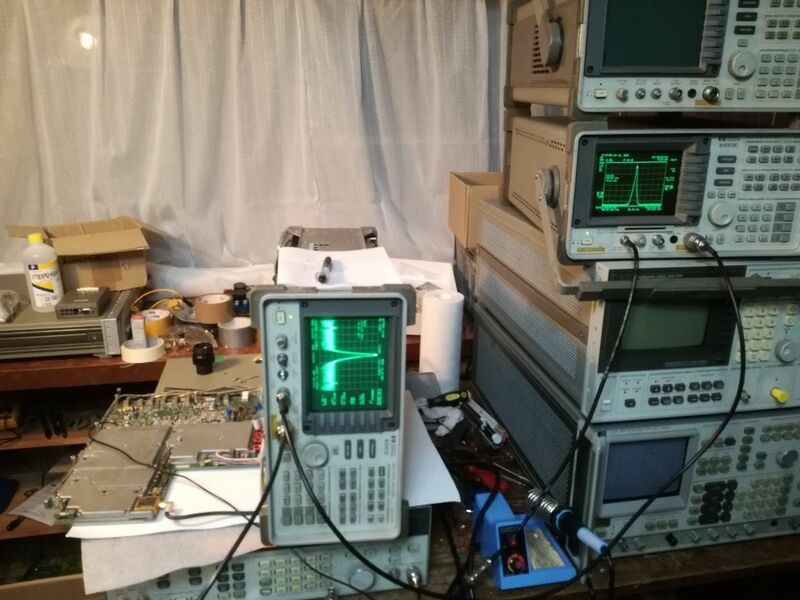 Progress with the HP 8561E – the 100 MHz to 600 MHz system, driving the 2nd converter, and other sub-system including the 300 MHz output. 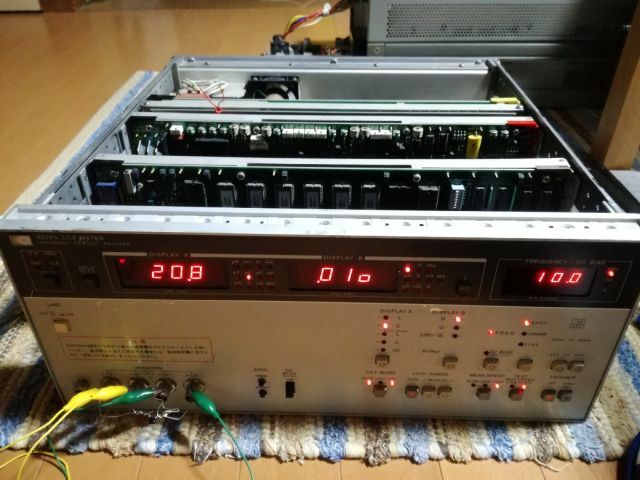 Initially, it looked like a failure of the 600 MHz doubler, so I decided to open up the RF case of the A15 assembly, and to go to component level troubleshooting. 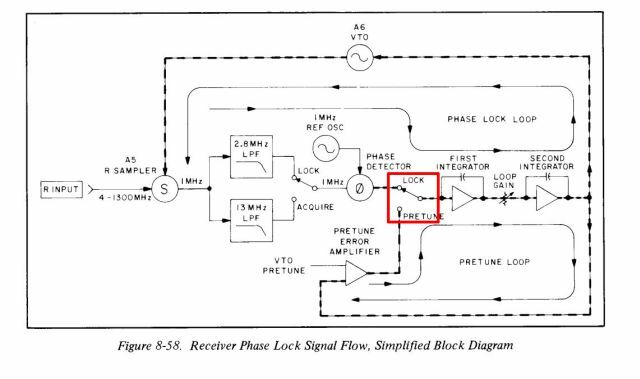 According to the block diagram, the 8561E first uses a trippler to convert the 100 MHz VCO output to 300 MHz, and then a doubler to convert the 300 MHz to 600 MHz. 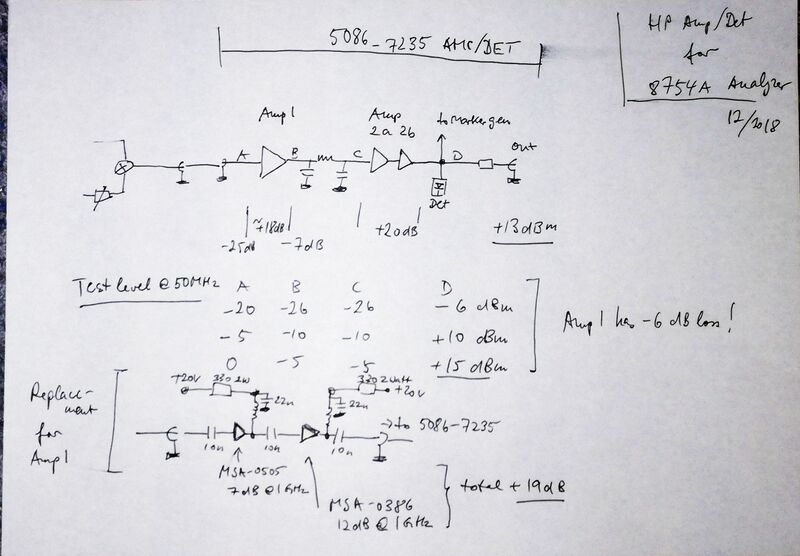 Note that there are various revisions of this board, not all use the same frequency multiplication scheme. 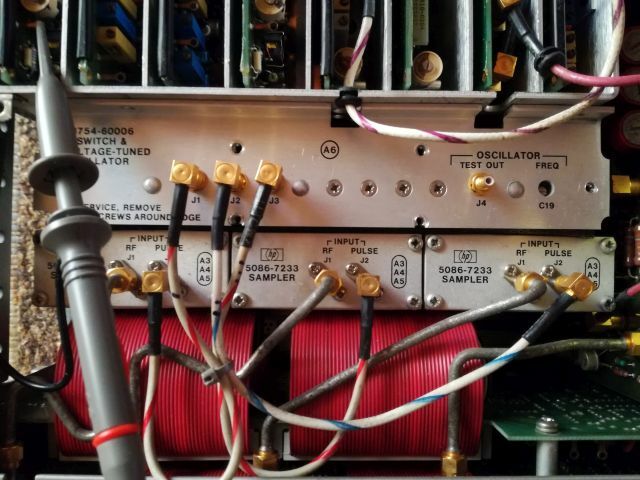 Only about 2 dBm are needed to drive the tripler, there is an amp stage in front of the doubler. 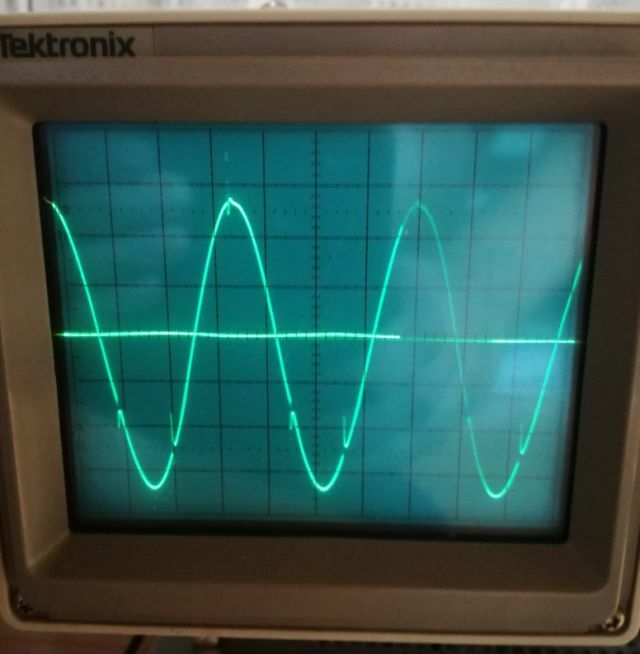 A quick test – the doubler is working just fine! 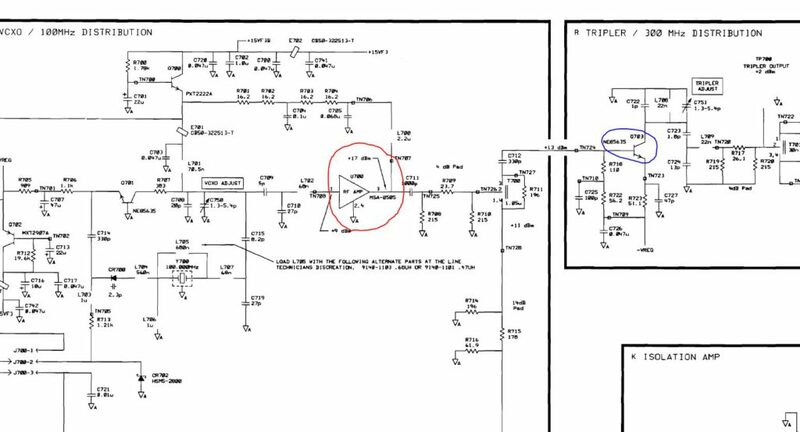 So, probably a fault in the trippler? 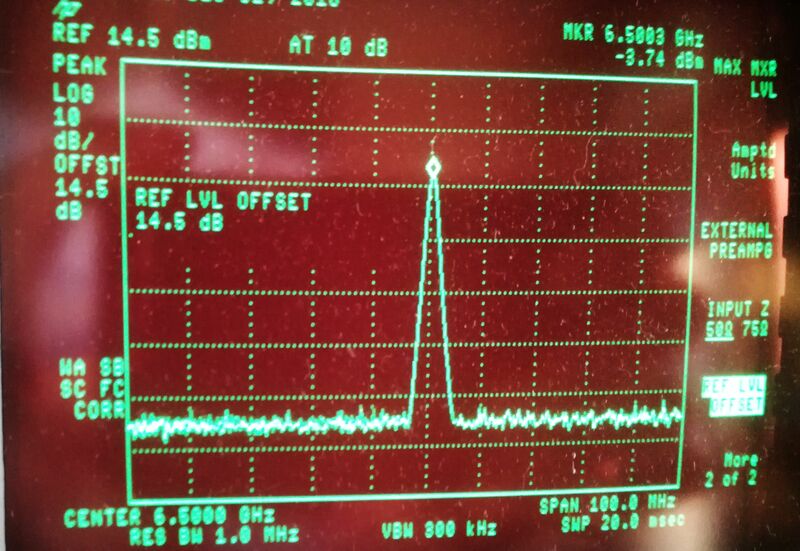 At least, there is 300 MHz present. What is going on? 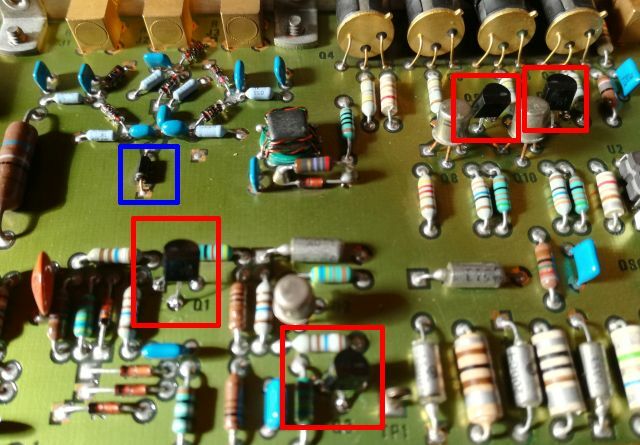 Let’s go one step further back – removed the tripler transistor, marked “Hb” which is a NE85635 transistor. 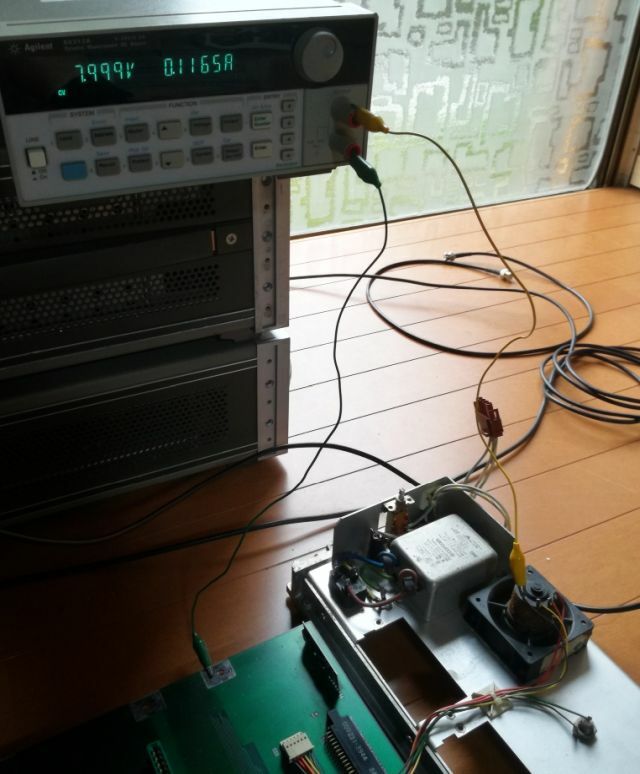 Let’s drive the 300 MHz circuit from an external generator. 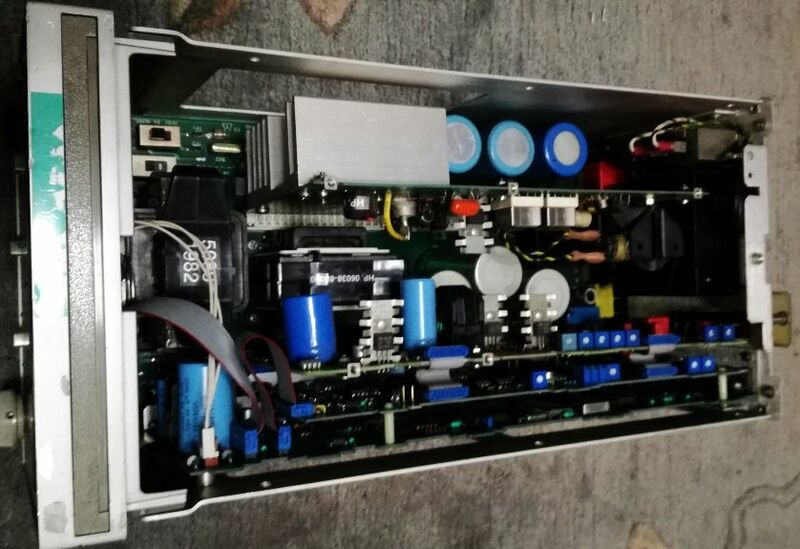 This is running at quite high power – about 18 dBm! 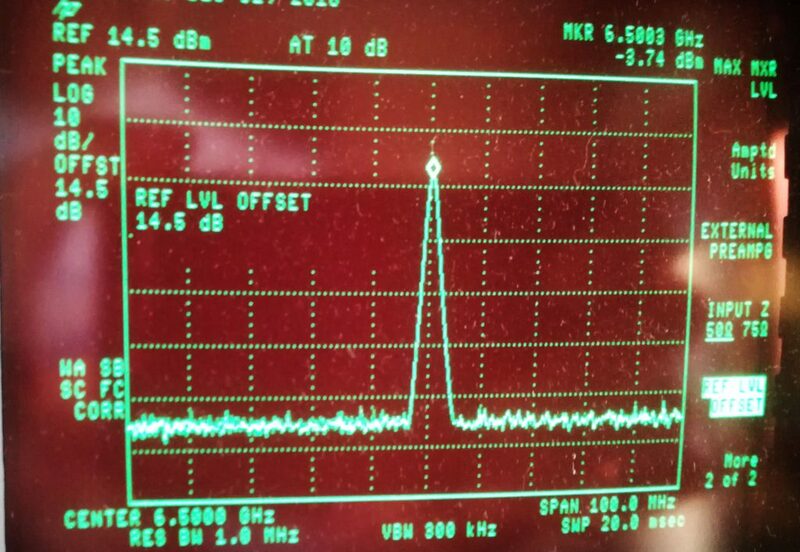 With the injected signal, all is working fine! 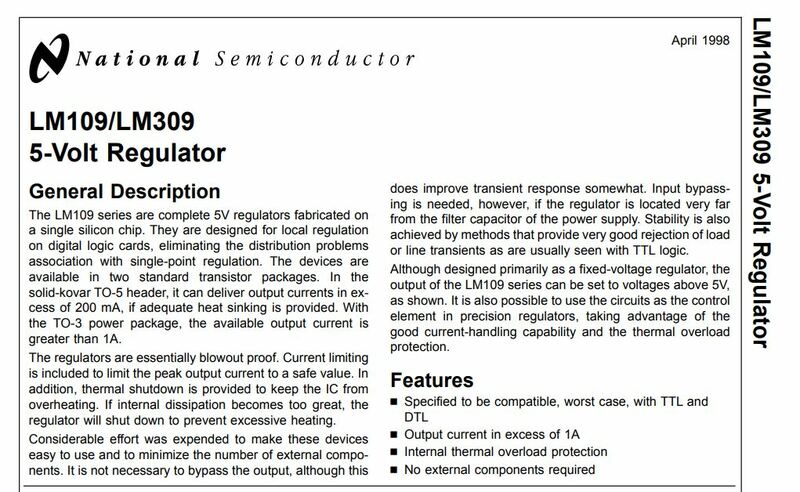 So, the 300 MHz transistor probably failed? 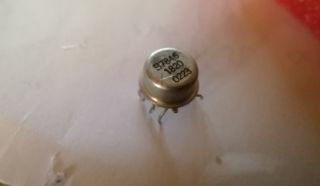 By luck and coincidence, I found a spare 2sc3603 transistor, marked “Oq”, and soldered it in. 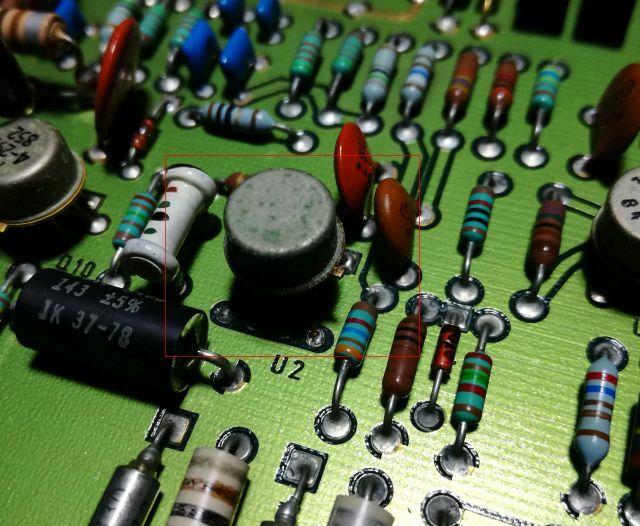 Surprisingly, the old transistor, once desoldered, tested just fine. 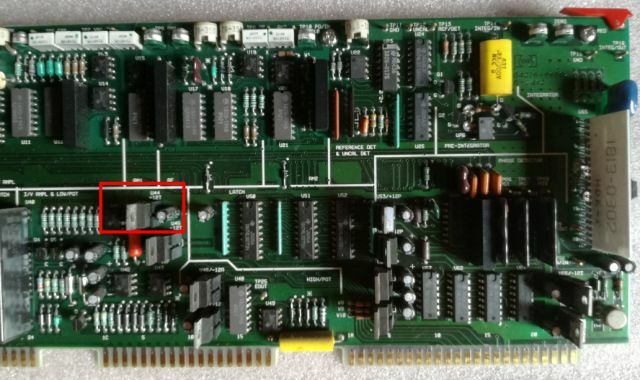 And, to confirm this, the 8561E still not working! 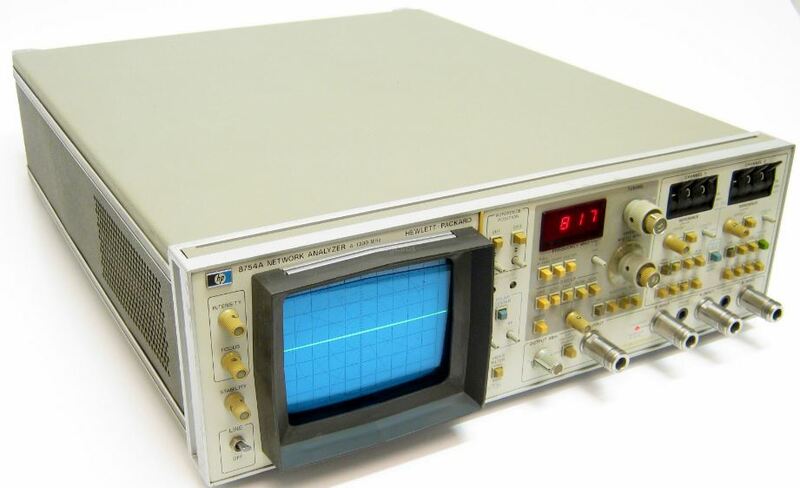 The 300 MHz system can be conveniently monitor by checking the 300 MHz cal output with another (working) spectrum analyzer. 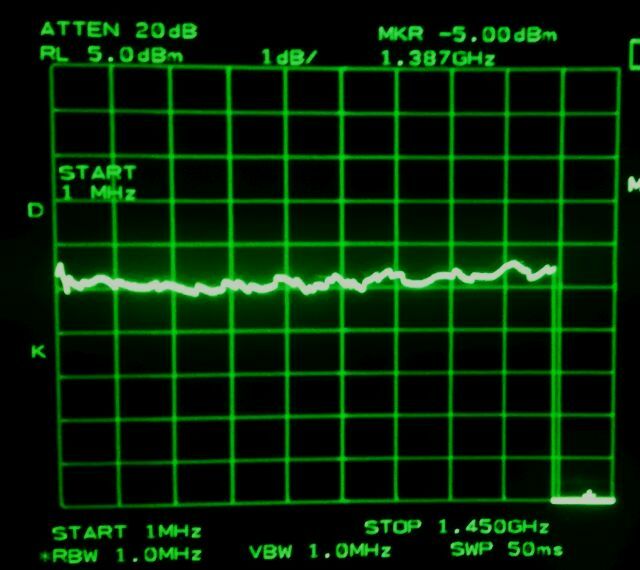 Well, we need to go back one more step – to the 100 MHz amp. 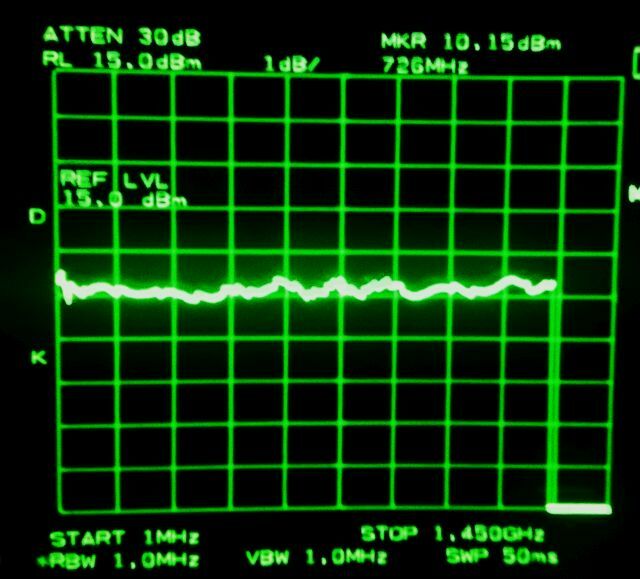 The tricky fact – the 100 MHz system is working, but after some careful measurements and calculations (I don’t have a precise active probe here), the power at the output of the 100 MHz amp is clearly low. 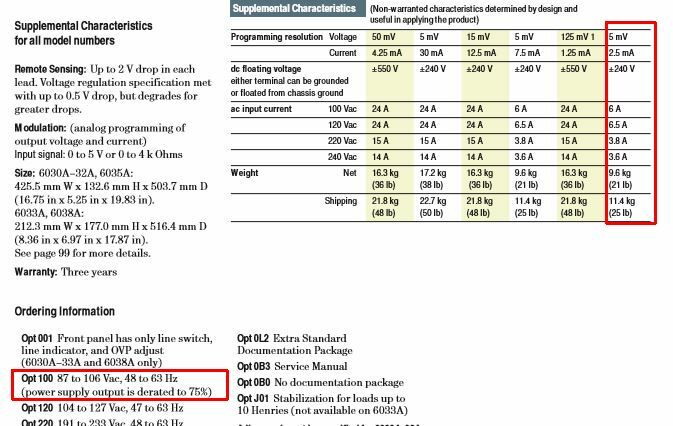 This needs to deliver well over 10 dBm of power, otherwise, all the following systems won’t work properly. 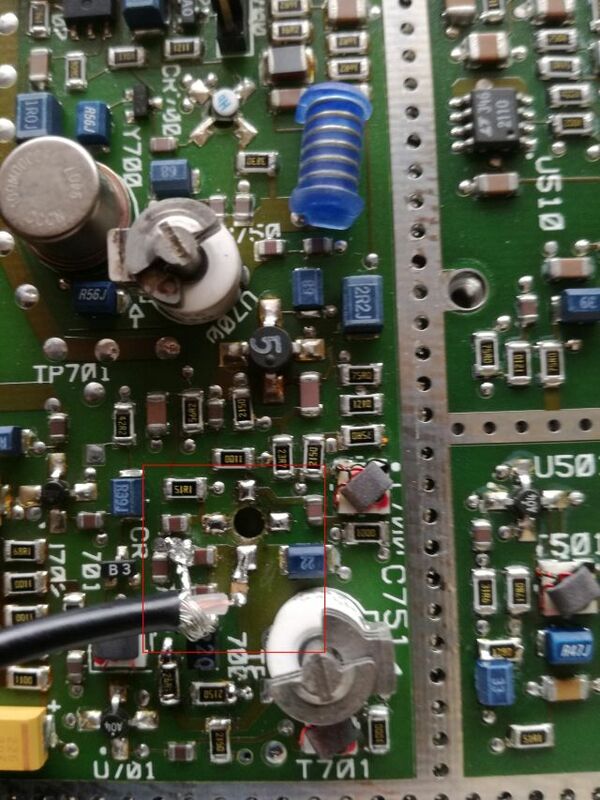 Fortunately, the 100 MHz amp is a fairly common part, a MSA-0505 gain block. 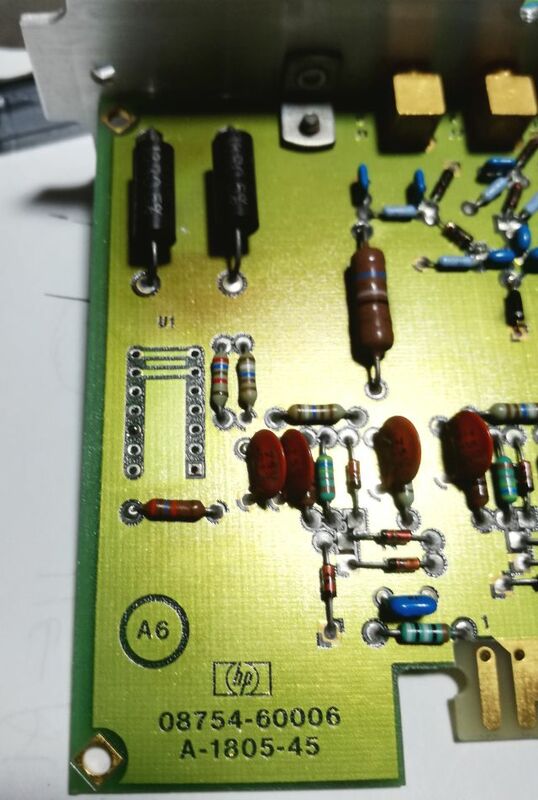 A last step – replaced the Oq transistor, with the old/original HP part (300 MHz circuit). 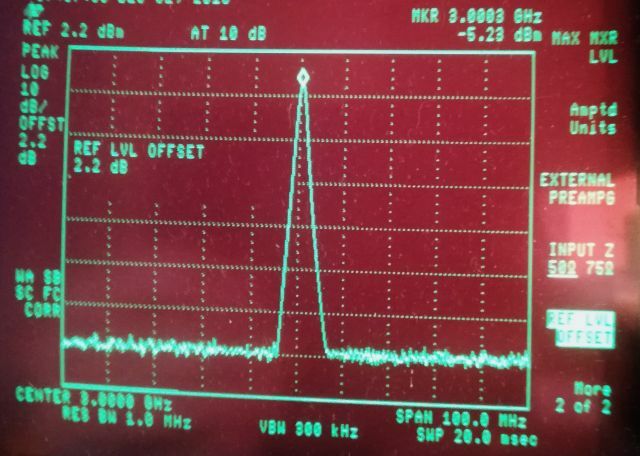 Finally, some tests – the 8561E (at least the low band up to 3 GHz is working again, and the CAL output is in spec (0.02 dB difference to another calibrated 300 MHz source! ).